Note: the basis for this page is Jones's Steam locomotive development which is being updated. The Lemon designs (that is those placed following Fowler's departure (the archaic 0-4-4T worthy of Collett) are sometimes attributed to Stanier as they appeared following his arrival, but Lemon is a more appropriate candidate as he was in charge during the interregnum. Rowledge, J.W.P. L.M.S. engines: names, numbers, types and classes. Newton Abbot: David & Charles, 1989. 160pp. Text is typescript, but includes outline diagrams of the LMS-designed locomotives. There is a separate section of plates. Dow (British steam horses) sums up some of the awe which used to be associated with the 0-10-0 Lickey banker: "One other banking engine deserves mention [the other was the Gresley Beyer Garratt 2-8-8-2]  'Big Emma' of the former L.M.S. An 0-10-0, and the only British engine of this wheel arrangement, 'Big Emma' (formerly No. 2290 and later No. 22290) was built in 1919 by the Midland to Fowler's design for banking passenger and freight trains up the l-in-37¾ Lickey incline of two miles near Bromsgrove on the Birmingham-Gloucester main line. She has four cylinders 16¾ in. in diameter by 28 in. stroke, 4 ft 7½t in. coupled wheels, a working pressure of 180 lb. per square inch and tractive effort of 43,313 lb. Weight of engine and tender in working order is 105 tons 2 cwt. Unusual features are the cab on the tender, which, when running in reverse, protects the enginemen, and the large electric headlight on the engine. 'Big Emma' is the most powerful tender engine in Great Britain." The tenses have not been changed and the reader is warned that Big Emma has gone (presumably the name stemmed from the WW1 names for big guns, such as Big Bertha. Ellis (page 161) called it "a whale of an engine". 0-10-0 banking engine; Midland Railway. Loco. Rly Carr. Wagon Rev., 1920, 26, 70-1. illus., diagr. (s. & f. els.). Atkins, C. P[hil] . More light on the Lickey Banker. Backtrack, 1987, 1, 64-6. Casserley, H.C. The Lickey Incline. Tarrant Hinton, 1976. (Locomotion Papers No. 91). 34pp. Essery, Bob. MR tender weatherboards and store sheets. Part 1. Midland Record, (21) 87-95. Essery, Bob. MR tender weatherboards and store sheets. Part 2. Midland Record, (22) 87-95. Engineers in this country were constantly meeting the difliculty of bridges over roads. With reference to the use of ten-wheel engines, the Midland Railway, of which he was the Chief Mechanical Engineer, was the only one that had a ten-wheel coupled engine running on a main line, and in a distance of two and a half miles that railway ran over road bridges-not large bridges-and the locomotive had to be designed to suit those particular bridges. It was a point to consider that in this country the number of bridges were intense and immense. Hunt, David and Essery, Bob. The Lickey Incline, its locomotives and operation. Part 3  The later bankers. LMS Journal, 2008, (21) 52-62. The 0-10-0, sometimes known as Big Bertha (the origins of the nickname are fully examined in a footnote), is fully examined, but before it was constructed a wide range of alternatives were examined. These included DS1653, a 2-10-0T (not illustrated); DS1677, a 2-6-6-2T Garratt (side elevation); DS1703, a 2-6-6-2T Garratt (side elevation); DS1737, a 0-6-6-0BT (side elevation). An 0-10-0T (DS1543) was also considered. Some of the proposed designs included taper boilers. The eventual banker was a tender locomotive aand the reason for the move away from a tank engine design is explored. R.H. Mann. Odd man out! Part 1: 1903-1926. Rly Wld, 1957, 18, 105-8. Ransome-Wallis, P. On railways at home and abroad. London: Batchworth, 1951. On page 78 the well-known photographer describes how he saw LMS Garratt No. 47972 on a 42 wagon train banked by LNER Garratt 69999 stall on the Lickey Incline to be rescued by the Midland 0-10-0 No. 58100. Unfortunately, no photograph of this event is reproduced here. Operating costs 1933-5: average annual mileage: 23270. Repair costs: 3.18 pence/engine mile; coal issued per engine mile 63.76lbs. This design originated as an update of the LNWR G2 class, and they are sometimes cited as the G3 class. The Belpaire boilers were possibly (see Talbot) originally, designed by Hughes, for the LNWR 0-8-0s. Unfortunately the bearing surface was inadequate, as is shown by E.S. Cox, A.J. Powell and Hawley, and the class was completely withdrawn before the earlier LNWR G2 class disappeared. Langridge disputes the "undersized" bearings and notes that comparitive tests were run between the SDJR 2-8-0 and a G2 on Midland Division coal trains in which the latter performed better. Langridge notes that neither outside cylinders nor Stephenson link motion could be adopted for this design. NEW 0-8-0 locomotives for coal traffic, L.M.S.R.. Rly Mag., 1929, 65, 186. illus. "They are similar in design to the exisiting G2 class", but noted Walschaerts gear with long travel valves. A.C.F.I. feed-water heating apparatus, L.M. & S. Ry.. Loco. Rly Carr. Wagon Rev., 1932, 38, 359. LOCOMOTIVES with feed-water heaters, L.M.S.R.. Rly Mag., 1932, 71, 352. illus. Aves, Bill. The LMS 7F 0-8-0s - 'Austin Sevens': unnecessary and perverse? Br. Rlys ill, 1995, 4, 358-67. Despite having long travel valves and inside Walschaerts valve gear and a boiler based on that of the LNWR 0-8-0s the design was unsatisfactory due to a long wheel base coupled with inferior Derby axleboxes and bearings which were always running hot. Aves argues that the LMS should have made better use of the ROD 2-8-0s which it had purchased. Includes excellent pictures of ACFI modified locomotives. Chacksfield, J.E..Ron Jarvis: from Midland Compound to the HST. 2004. . Page 67: Jarvis proposed Stroudley balancing to lessen the hot box problems but this was turned down by Coleman. Annual mileage statistics are quoted for the 7F for 1950: 18,372 miles. Hawley, RA. The Fowler class "G3" 0-8-0s. Trains ill., 1952, 5, 221-3. illus., table. A history of the class. Incorporates material written in response to the original J. Stephenson Loco. Soc. article. Powell, A.J. Living with London Midland locomotives. 1977. Reeves, John. LMS locomotive operating costs 1933-1935. Part 1  Freight tender engines. LMS Journal (7) 7-21. Rowledge, P. The Austin Sevens [letter]. Br. Rlys ill., 1995, 4, 553. In May 1940 there was an unimplemented proposal to replace the manganese bronze axleboxes with steel in an attempt to reduce the number of hot boxes associated with the use of larger cylinders. There was also a problem of the fracture of fireboxes at the shoulders. This was alleviated by the adiption of Monel stays in place of copper, the redesign of the backplate, a new firedoor and a revised tube arrangement. Pp.102 and 120:Notes that they were quite popular with former LNWR enginemen and that fifty had been allocated to the Western Division initially (91 were allocated to the Central and 34 to the Midland Divisions). Also notes that they had originated in trials between the S&DJR 2-8-0s and a G2. Thorley, W.G.F. A breath of steam. Vol. 1. London, 1975. Page 121: "The radical weaknesses of the 'Austin Sevens' were becoming only too apparent as they aggregated mileage from new engine or heavy shop repairs; connecting rod little end bush wear was very heavy, it was impossible to keep gudgeon pin nuts tight for more than a few days, and longitudinal fractures developed in the gudgeon pins themselves. During 1934 no fewer than six of this class at Wellingborough... suffered broken left hand driving coupling rod crank-pins, whilst No 9502 distingiushed itself by breaking its lh piston head. These defects, coupled with the heavy incidence of heated engine axleboxes already described and a host of minor defects such as leaking injector steam and delivery pipes, made the class a heavy drain on shed maintenance resources. It redeemed itself only by good steaming qualities and efficient use of the steam when in service. WITHDRAWAL of a standard class. Rly Mag., 1949, 95, 343. illus. The early withdrawal date should be noted: in part this date reflected part of the oil burning conversion programme. During 1926 design work had reached an advanced stage for a 4-6-2 compound locomotive, but whilst this work was in progress the Motive Power Department borrowed a Castle locomotive from the GWR for trials on the Euston to Carlisle route. The trials were successful. Work on the Pacific design was halted and the C.M.E. 's Department was requested to supply a locomotive, which could meet the Castle specification. Further notes on the origin of the design are presented in the introduction to the retrospective material. The new 4-6-0 locomotive was massive in appearance, due to its large, parallel boiler and squat chimney. Three 18 x 26 in cylinders, coupled with an evaporative heating surface of 2081 ft2 and a boiler pressure of 250 lb/in2 produced a powerful locomotive suitable for hauling the heaviest express trains of the period. The significance of the design was not ignored by the technical press. Several extensive accounts appeared and many of these were accompanied by detailed, sectionalized drawings. The class was rebuilt with new boilers and cylinders under Stanier's successors, although the last was not rebuilt until 1955 (Rowledge Engines of the LMS). 4-6-0 three-cylinder express passenger engines, L.M. & S. Ry the "Royal Scot" No. 6100. Loco. Rly Carr. Wagon Rev., 1927, 33, 239-40. illus., diagr. (s. el.). L.M.S.R. 3-cylinder express locomotive, "Royal Scot". Engineer, 1927, 144, 154-5; 390-1 + folding plate. illus., 5 diagrs. (incl.s.el. ), 2 plans. NEW 4-6-0 express passenger locomotive, LM.S.R.. Rly Mag., 1927, 61, 184 + plate f.p. 173. illus. The "ROYAL SCOT" class express locomotives, L.M.S.R.. Rly Engr. 1928, 49, 11-15 + folding plate. 4 illus., 7 diagrs. THREE-CYLINDER express locomotive, "Royal Scot", L.M. & S. R. Loco. Rly Carr. Wagon Rev., 1928, 34, 36 + plate. f.p.. illus. Johnson, W. Arnold. Alloy steels for locomotive construction. Proc. Instn Mech. Engrs., 1929, 117, 1087-97. Alloy steels considered included those with vanadium; chromium-vanadium; Vibrac steel manufactured by Armstrong Whiworth used for the coupling- and connecting-rods of the Royal Scot class of locomotives which is a nickel-chrome-molybdenum steel. The composition was: carbon, 0.3%; silicon, 0.15%; manganese, 0.6%; phosphorus, 0.03%; sulphur 0.04%; nickel 2.5%; chromium, 0.6%; and molybdenum,0.6%. It was claimed that the molybdenum content prevents temper brittleness. From 1931 smoke deflector plates were fitted. In addition, so~me experimental alterations were introduced to try to improve the driver's visibility. (See also Mount's accident report): initial report of accident and enquiry see Loco. Rly. Carr. Rev., 1931, 37, 127. SMOKE-DEFLECTORS on the L.M.S.R.. Rly Mag., 1931, 69, 227-8. CHIMNEY deflectors, L.M. & S. Ry. locomotives. Loco. Rly Carr. Wagon Rev., 1933, 39, 42. illus. No. 6161 was fitted with a stove pipe chimney, cut away smokebox and a more rounded smokebox door. SMOKE deflection experiments on the Royal Scot class. Rly Mag., 1932, 70, 153-4. SMOKE deflection experiments on the Royal Scot class. Rly Mag., 1932, 71, 309. A bulbous smokebox door plus "wing" plates behind the chimney. SMOKE deflection experiments on the Royal Scot class. Rly Mag., 1932, 71, 466. 1927 : London-Carlisle (via Shap) dynamometer car trials. The results were compared with tests on the 4P compound and "Claughton" classes. 1928 : Euston-Glasgow test runs. L.M. & S. Ry. locomotive "Royal Scot". Loco. Rly Carr. Wagon Rev., 1928, 34, 222-5. diagr., 2 tables. 400-mile non-stop runs by "The Royal Scot" expresses, L.M.S.R.. Rly Mag., 1928, 62, 460. 2 illus. A LONG non-stop run on the L.M.&S.Ry. Loco. Rly Carr.Wagon Rev., 1929, 35, 269. Twells, Nelson. LMS 'Royal Scot' Class No. 6140 Hector. LMS J., 2005 (9), 17-19. On what was probably 18 July 1932 No. 6140 hauling the 17.25 Liverpool to Euston averaged more than 67 mile/h between Crewe and Willesden. There is a photograph (very well reproduced) of Driver J.E. Farrell and Fireman Pritchard being congratulated by Sir Josiah Stamp on arrival at Euston. Ernest Lemon is credited with being present. An interesting point is that Driver Farrell's name is on the cab-side. There is also an excellent illustration of the locomotive's nameplate and its badge of the earlier Hector. Brackets for driver's names are shown on 6123 Royal Irish Fusilier at Crewe North on 17 July 1932 (W.L. Good) and 6113 Cameronian on Rugby shed. (J.A.G. Coltas).The feature also refers to record run on the Mancunian from Wilmslow to Euston. In 1932 and 1933 special trains were chartered between London and Coventry to take visitors to a motor-car factory. The L.M.S. took the opportunity to demonstrate railway speed by using "Royal Scot" locomotives on light trains. Allen, C.J. Some new L.M.S.R.speed records. Rly Mag., 1932, 71, 356-8. table. Allen, C.J. A "record of records" on the L.M.S.R. Rly Mag., 1933, 73, 318-20. table. No.6100 Royal Scot was shipped to the United States for the World's Fair. A bell and commemorative plaques were presented to the locomotive. The bell was removed when the locomotive was rebuilt with a taper-boiler. Talbot's Pictorial tribute to Crewe Works PLATE 34 shows locomotive in prepared state outside Crewe Works. A retrospective article, by Arnold Tortorella is cconsided below and Hamilton Ellis's London Midland & Scottish page 126 et seq adds depth to some of Tortorella's coverage.. The FINISH of the Royal Scot tour. Rly Mag., 1934, 74, 38-41.4 illus. The ROYAL Scot in North America. Rly Mag., 1933, 72, 460-1. illus., map. The ROYAL Scot, L.M.S.R. : return from U.S.and Canadian tour. Loco. Rly Carr. Wagon Rev., 1934, 40, 20. Includes a note on the special commemorative plaques fixed to the locomotive. The "ROYAL Scot" to be exhibited at Chicago World's Fair. Loco. Rly Carr. Wagon Rev., 1933, 39, 95. SHIPPING the "Royal Scot" train to America. Loco. Rly Carr. Wagon Rev., 1933, 39, 144. 3 illus. TOUR of the "Royal Scot" train to the Pacific Coast. Loco. Rly Carr. Wagon Rev., 1933, 39, 375. Voyageur, pseud. The "Royal Scot" in America. Rly Mag., 1933, 73, 185-8. 5 illus. Mishap to express: fireman averts disaster: scalded by steam escape. The Scotsman [newspaper] 28 February 1936. Cox and Holcroft disagreed on the origins of the Royal Scot design. Holcroft suggested that the type was merely a 3-cylinder version of Maunsell's Lord Nelson class. This was refuted by Cox who stated that the design was unique, except in that the fireboxes and cabs of the two types were similar. The basis for the controversy was due to the LMS acquisition of a set of Lord Nelson drawings to help in the design work. The monograph by Essery and Jenkinson is especially important. The majority of the references consider both the rebuilt and unrebuilt forms, although some as the derailment at Weaver Junction or the locomotive exchanges refer only to one type. As an increasing amount of material only refers to the rebuilt locomotives that section shouuld also be consulted..
Anderson recommended that the guiding effect of the bogie fitted to the "Royal Scot" class should be increased and that the flanges should be deepened if possible. Atkins noted that a Royal Scot class did the London Euston to Aberdeen return run of 1079 miles within 36 hours..
Locomotives built within a limited time scale: The design and construction of the Royal Scots took place between November 1926 when the design was sketched out, the order for fifty locomotives being placed with NBL on 7 January 1927 and delivery between 14 July and December 1927 (delivery at the end was seven weeks late). Baxter, F.L. Balancing of three-cylinder locomotives. Engineer, 1935, 160, 84-6. 5 diagrs., 8 tables. The Royal Scot class is considered on a comparative basis. Bond, R.C. Ten years' experience with the L.M.S. 4-6-2 non-condensing turbine locomotive, No.6202. J. lnstn Loco. Engrs, 1946, 36, 182-230. Disc. : 231-65 (Paper No. 458). Data were presented which showed that coal consumption of the Royal Scot class increased by 8% over 28,000 miles of running due to wear in the valves and pistons. The book of the 'Royal Scots'. British Railways Illustrated special. 1999 [BLPC]. 108pp. According to Rutherford these contain extracts from the LMS Locomotive History cards held at the NRM. Cameron, K.R.M. in Peter Townend. LNER Pacifics remembered. Irwell Press, 2014. Chapter 10. Clay, J.F. Their place in history. No. 1. The Royal Scots. J. Stephenson Loco. Soc., 1966, 42, 5-15. 12 illus. Cook, A.F. Raising steam on the LMS: the evolution of LMS locomotive boilers. Huntingdon: RCTS, 1999. 233pp. Cox, E.S. and Johansen, F.C. Locomotive frames. J. Instn Loco. Engrs, 1948, 38, 81-115. Disc. :115-96 (Paper No.473). On p. 175 the authors, and on p. 168 J.C. Loach, remark on the difficulties in maintaining the frames of this class. Cox, E.S. Locomotive panorama. 1965. See p.59 for the Cox v Holcroft controversy. Cox, E.S. Mechanical development in Doherty, Douglas: Royal Scots of the LMS. 1970. A useful assessment of both the original design and the rebuilt version. Doherty, Douglas, editor. Royal Scots of the LMS. London: Ian Allan, 1970. Dunn, William. The LMS Royal Scot locomotives: a pictorial review of their early days. LMS J., 2008, 85th Anniversary Issue, 68-76. Illustrations of unrebuilt locomotives in their original condition, mainly without smoke deflectors and with original names. Holt, Geoff. The red Scots. Modellers Backtrack, 1993, 3, 4-13. The author's definition extends to the unrebuilt locomotives, plus the solitary 6170 British Legion. The approach is that of the model maker who was constructing three 7mm models (two unrebuilt locomotives at different stages in their existence plus No. 6170 for David Jenkinson). There is comment on the errors which have been detected in many of the drawings (diagrams) available to model makers. The illustrations and diagrams have been gathered to show the detail differences and changes wrought on the locomotives: these include smoke deflector plates and steps. Hunt, David with Bob Essery and Fred James. The rebuilt 'Royal Scots'. LMS Locomotive Profiles No.1. Highly detailed drawings from NRM collections. A very significant source of information. Fowler, H. Discussion on Fry, L.H. Some experimental results from a three-cylinder compound locomotive. Proc. Instn mech. Engrs, 1927, (2), 923-54. Disc. : 955-1024. Pp.955-61 : Fowler comments on Royal Scot performance. Holcroft, H. "Castles", "Lord Nelsons", and "Royal Scots". Rly Mag., 1947, 93, 13-15; 27. 3 illus. Holcroft, H. Discussion on Cox, E.S. A modern locomotive history: ten years' development on the L.M.S.  1923-1932. J. Instn Loco. Engrs, 1946, 36, 100-41. Disc. : 141-70; 275-6. (Paper No.457). Pp. 146-8 : Holcroft in the above references states his case for the connection between the Lord Nelson and Royal Scot classes. Jenkinson, D. The "Royal Scots". Part 1. Rly Wld, 1967, 28, 422-7. 12 illus., 2 tables. This historical review is mainly concerned with externals, such as liveries and smoke deflector plates. Part 2 (Rly Wld, 1967, 28, 480-3) is mostly, but not entirely, restricted to the rebuilt locomotives. Johnnson, Peter G. Footplate impressions in Doherty, Douglas: Royal Scots of the LMS. 1970. Most of his impressions as a fireman and driver were of the rebuilt type, but he stated that far more skill was required to fire and drive the unrebuilt locomotives which do not like a thick fire. The exhaust steam injector differed greatly between the two types. Mount, A.H.L. Report on the accident that occurred on the 22nd March, 1931 to an express passenger train, which left the rails at Leighton Buzzard. Ministry of Transport : Railway accidents.. . which occurred during the three months ending 31st March, 1931. London, HMSO, 1931. 15 p. + folding plate, diagr., 2 plans. The accident was partly caused by the driver's view being obscured by drifting smoke. Mount suggested the addition of deflector plates. Nock, O.S. Three generations of West Coast 4-6-0's : Claughtons  Royal Scots  converted Scots. Rly pict., 1949, 2, 76-81; 98-104. 8 illus., 2 tables. John Powell. In the firebox of Scots Guardsman: Pensive Moments. Rly Wld, 1991, 52, 302-6. Powell, John. Performance in service in Doherty, Douglas: Royal Scots of the LMS. 1970. An assessment mainly in terms of performance, but there is also some criticism of design faults, notably the location of the inside cylinder which made maintenance difficult, and surprisingly perhaps, the only modest gain in performance terms of the rebuilt locomotives. Powell also noted that the original locomotives were "remarkably free from slipping", unlike the rebuilt locomotives..
Rutherford, Michael. The 'Scots' and their weans. Part One. (Railway Reflections No. 112). Backtrack, 2005, 19, 356-65. Considers locomotive policy in general on the LMS, including the purchase of ex-ROD 2-8-0s, the Claughtons and the Bridge Stress Committee before turning to the influences which were worked into the Royal Scot and Patriot classes (and the differences between them). External influences included that of the GWR Castle class and to a minor extent the Maunsell Lord Nelson class. Internal influences were drawn mainly from the three-cylinder compounds and the 2-6-4T then under development at Derby. The role of Herbert Chambers and Eric Langridge is noted (the former in liaising with NBL on the design of the Royal Scot). Sir Henry Fowler's involvement is also noted. Rutherford notes some of the disadvantages associated with the introduction of Pacifics which included the provision of larger turntables and the greater "grip" provided by a 4-6-0 when hauling trains on steep gradients (tests with A1 2573 Harvester on restarting on Cockburnspath incline in June 1925 are cited against Pacifics as 2573 failed to restart with a load of 520 tons). Rutherford, Michael. The 'Scots' and their weans. Part 2. (Railway Reflections No. 113). Backtrack, 2005, 19, 424-32. Notes that the introduction of the class more or less coincided with the Company's discovery of the need for publicity, and locomotives were exhibited at Liverpool, Manchester, Crewe, Glasgow and Dundee at various times between November 1927 and April 1928. The Liverpool & Manchester Railway Centenary celebrations at Wavertree were graced by 6161 The King's Own and by 6029 King Stephen and 850 Lord Nelson. Rutherford notes that many booklets and what are now termed "collectables" were produced to back up this publicity effort. Rutherford gets rather carried away and includes LMS poster sales (none of which reflected the locomotive class), the lack of staff loyalty to the new company, and the introduction of named trains (which might be hauled by the Royal Scots, but not those from St Pancras for quite some time). It is noted that Fowler reported the results of dynamometer car tests conducted between London and Crewe in response to a paper by Lawford Fry (Proc. Instn Mech. Engrs). Rutherford considered the class to be free steaming, free running and fast with easy-to-fire grates. Herbert Chambers close involvement is recorded. Notes that modifications were made to the frame design (see Cox Locomotive panorama v. 1 pp. 87 and 115 (especially latter). States that Caprotti valve gear and compound versions were both considered. There were serious problems with drifting exhaust which led to smoke deflectors and with rough riding. Table 3 compares the overall length, coupled wheelbase length and bogie length of the Royal Scot, Lord Nelson, King classes and the proposed compound 4-6-0 and notes that the last-named would have been better proportioned. It also notes that both the King (Midham) and Lord Nelson (Kent House) had been prone to derailments. The built-up smokebox was a source of problems and Stanier made an early decision to fit the class with taper boilers. Under Stanier the springing was improved, Swindon type axleboxes were fitted and new frames and tenders greatly improved the locomotives. Notes that No. 6148 reached Southampton on 14 October 1935. Rutherford, Michael. The 'Scots' and their weans. Part 3. (Railway Reflections No. 114). Backtrack, 2005, 19, 487-95.. In spite of silly title for feature (the weans were not manufactured in Glasgow!) the references for both classes are listed within a highly sensible classification: drawings and official photographs; contemporary accounts; retropsective accounts; performance (mainly from Nock); train services and names. The illus. on page 492 of Royal Iniskinning Fusilier is important for showing the vacuum pump drive; the coil springs fitted to the crank axle and second driving axle (the latter were replaced by laminated springs during rebuilding. The Patriot class was characterized by variations in bogie and chassis types, and only the last series were selected for rebuilding with larger boilers. The frames used for the Patriots were stronger than those for the Royal Scot class as they lacked the cut-outs for lightening. Furthermore, the cylinders were smaller and frame cracking was not experienced. The weight quoted for the Patriots was 83 tons 8 cwt as aginst 84 tons 18 cwt for the Royal Scots, but the CME had claimed 80 tons 15 cwt in the case of the former. Annual milegaes are quoted for both classes. Replacemrent of Schmidt piston rings by narrow rings on the Royal Scots reduced coal consumption from 70lb/mile to 35lb/mile. He had seen the first Royal Scot on a visit to NBL and considered that it was "a most impressive locomotive"
Tester, Adrian. A defence of the Midland/ LMS Class 4 0-6-0. Aberystwyth: Crimson Lake, 2013. 274pp. On page 86 the derailment of No. 6131 Planet at Weaver Junction on 14 January is discussed. See also Anderson (above) and also report by Anderson on derailment of Maunsell LN at Kednt House on 23 January 1930..
Tortorella, Arnold. The return and exhibition of the 'Royal Scot'. Backtrack, 2015, 29, 134-9. The Royal Scot tour lasted for seven months and ended in December 1933. The locomotive was under the care of C.O.D. Anderson, Locomotve Superintendent, and footplatemen from Carlisle: Driver William Gilbertson, Fireman John Jackson, Fitter William C. Woods and an extra fireman Tom Blackett. T.C. Byrom acted as Liaison Officer. The tour visited Chicago twice; crossed the Canadian Rockies en route to Vancouver; went on to San Francisco to Los Angeles, Salt Lake City and Denver. The article is based on a report in the Glasgow Herald for 6 December 1933 and The Times for 16 December which recorded the King's message of appreciation to the LMS for the diplomatic success of the tour. The subsequent tour of Scotland is noted, but that of England and Wales is not although there is an interesting photograph of the train leaving Llandudno with both the headlamp and the bell still in place. Another illustration reproduces the brochure cover which appears to be a montage of flag-bedecked locomotive, fitted with headlamp and bell, LNWR signals and Highland pipers. Tuplin, W.A. A critical appreciation in Doherty, Douglas: Royal Scots of the LMS. 1970. An assessment mainly of the original design: suggests that the poor ride might have been improved if the wheel-base of the Lord Nelson had been adopted. Tuplin, W.A. Sir Henry Fowler's "Royal Scots": a survey to mark the conversion of the last unrebuilt "Scot", No.46137. Trains ill., 1955, 8, 244-9. 5 illus., 3 tables. A critical survey. In his British steam since 1900 Tuplin noted that the wrapper-type smokebox, leaky valves, and indifferent axleboxes were defects that should never have been permitted in any design completed in 1927 and that adoption of the general layout of a three-cylinder compound 4-6-0 projected by Derby in 1924 would have provided better access to the inside mechanism, and with strong side control of the bogie might have made a better-riding engine..
Names : See also S.P.B. Mais. Anderson, David. The 'Royal Scots' and their nameplates. Steam Wld., (51) 31-7. Quotes from S.P.B. Mais book The Royal Scot and her forty-nine sisters on the origin of the Royal Scot name. The clarity of the illustrations is noteworthy: some of the more unusual include: 6161 King's Own (with badge below the name); 6127 Old Contetibles; 6129 Comet (with engraved view of early locomotive carried beneath plate); 6161 suffering smoke deflection experiments in 1929; the naming ceremony for Sherwood Forester at Derby on 16 June 1933; 6125 Lancashire Witch (badge poorly displayed); 6138 The London Irish Rifleman; 6141 The North Staffordshire Regiment (both with crests above) and in colour: British Legion, The Prince of Wales Volunteers South Lancashire, Royal Army Service Corps, Civil Service Rifleman and Royal Scot in situ; also some preserved plates. Serious examination of the relationship between locomotive names and the "organizations" associated including regiments, both in relation to the original ceremony and subsequent use. Thus The Manchester Regiment worked through to Southampton Docks from Manchester in 1935 conveying wives and children for a reunion. Locomotive names from early locomotives, e.g. Novelty. [LIST of names selected for the Royal Scot class]. Loco. Rly Carr. Wagon Rev., 1928, 34, 69. "ROYAL" locomotives, L.M.S.R.. Rly Mag., 1929, 64, 380-1. 3 illus. ANOTHER L.M.S.R. engine named after county regiment naming ceremony of engine No. 6131 "Royal Warwickshire Regiment" at New Street Station, Birmingham. Rly Gaz., 1938, 68, 1204; 1214. illus. CEREMONY with L.M.S.R. locomotive at Northampton. Rly Gaz., 1935, 63, 696. Naming ceremony 6147 The Northamptonshire Regiment. LOCOMOTIVE naming ceremony. Rly Mag., 1938, 83, 153. Eight Royal Scot class 4-6-0 express engines had been named after famous Territorial Regiments of London and the Home Counties. No. 6144 Ostrich, renamed Honourable Artillery Company, and No. 6160 was Queen Victoria's Rifleman, 6162 Queen's Westminster Rifleman, 6163 Civil Service Rifleman, 6164 The Artists' Rifleman, 6165 The Ranger, (12th London Regiment), 6166 London Rifle Brigade, and 6167 The Hertfordshire Regiment. No. 6147 The Nortamptonshire Regiment at Castle Station, Northampton, by Lieutenant-General Sir Harry Knox, Colonel of the Regiment. [Naming ceremony: No. 6122 Sherwood Forester], Backtrack, 1998, 12, p. 457. At Derby on 17 June 1933. NEW "Royal Scot" locomotive, L.M.S. Ry.. Loco. Rly Carr. Wagon Rev., 1930, 36, 363. illus. No.6169: The Boy Scout. Fowler noted that Baden Powell was the grandson of George Stephenson. Fowler shown on the footplate with H.H. Benrose. PRESENTATION of plaques to L.M.S.R. engine "Black Watch". Rly Mag., 1930, 67, 502. illus. No. 6126 Royal Army Service Corps at Euston Station in the presence of E.B. Fielden, Deputy Chairman of the LMS and Major-General W.K. Tarver. Driver A.W. Harris and Fireman H. Banting of Camden shed and who had served in WW1 were on the footplate. REGIMENTAL plaques attached to L.M.S.R. No.6123, "Royal Irish Fusilier". Rly Mag., 1930, 67, 164. 2 illus. REGIMENTAL plaques for L.M.S.R. locomotive. Rly Gaz., 1935, 63, 72. REGIMENTAL plaques for L.M.S.R. locomotive. Rly Gaz., 1947, 86, 427. 3 illus. [REGIMENTAL plaques presented to No.6103 Royal Scots Fusilier]. Rly Mag., 1935, 77, 229. [REGIMENTAL plaques presented to No.6130 The West Yorkshire Regiment]. Rly Mag., 1935, 77, 154. [REGIMENTAL plaques presented to No.6134 The Cheshire Regiment]. Rly Mag., 1947, 93, 256. illus. [REGIMENTAL plaques presented to No.6147 The Northamptonshire Regiment]. Rly Mag., 1935, 77, 465. On October 24, No. 6138 Fury, the engine of the special train in which the officers and men of the 1st Battalion The Royal Ulster Rifles travelled to Heysham, en route for Belfast, was renamed the London Irish Rifleman. At Glasgow (Central) Station, with military ceremonial provided by a Guard of Honour from the Regiment, The Rt. Hon. The Lord Provost of Glasgow, Sir Hector McNeil, J.P., unveiled on British Railways Locomotive No. 46121 a plaque bearing the Regimental Crests presented on behalf of the Regiment by the Officer Commanding, Highland Light Infantry (The City of Glasgow Regiment). Mr. T. F. Cameron, Chief Regional Officer, Scottish Region presided. Essery, R.J. and Harris, N. LMS reflections: a collection of photographs from the Hulton Picture Company. 1986. Page 140: unveiling of Regimental Crest on 6112 Sherwood Forester by Major R.L. Sherbrook at Derby Works on 16 June 1933. Page 8: Presentation of Regimental Crest to 6124 London Scottish by Colonel L.D. Henderson, Commanding Officer, at Euston on 11 July 1937 prior to hauling regiment off to Scotland for training. No.6170 Fury: 1930: Fowler: experimental high-pressure compound locomotive. This locomotive was equipped with a Schmidt-Henschel boiler with a maximum boiler pressure of 900 lb/in2. Little was written about the locomotive at the time: the contemporary material was spartan in comparison with the literature on the Gresley/Yarrow (W1) project. The locomotive never ran in service and even E.S. Cox (pp.90-1 v.1) in his Locomotive panorama adds little to this optimistic but ill-starred experiment. The paper by Duffy is very significant as it places the locomotive within the context of the other Schmidt high pressure locomotives built at that time in Germany, France and Canada. Duffy cites both Atkins and Tufnell..
DOUBLE-PRESSURE compound "Royal Scot" locomotive, L.M.S.R.. Rly Mag., 1930, 66, 92-3. illus. Allen, C.J. Lone locomotives. Trains Ann., 1956, 67-79; 82-4. 25 illus. Atkins, C.P. "Fury" on trial. Rly Mag., 1978, 124, 579-81. Bond, R.C. Years of transition. J. Instn Loco. Engrs, 1953, 43, 439-63 (Presidential Address). A review of experimental locomotive developments which included Fury. Carney, Ian. Fowler's Fury  the story of a unique British locomotive. Southampton: Noodle Books, 2012. 96pp. Reviewed by Adrian Tester? in Backtrack, 2013, 27, 126 and condemned for its flawed text which the review attempts to rectify. Many good illustrations. Cox, E.S. Locomotive panorama. Volume 1. pp. 90-1. The only other attempt at the unconventional steam engine with which the L.M.S. was associated up to this time, was the application of the German Schmidt-Henschel boiler to a ' Royal Scot ' built by the N.B. Loco. Co. Inc. The project was sponsored in this country by the Superheater Co. Fully described in the technical press the marvel in looking back is that anyone thought that so complex an assembly of what was virtually three boilers in the space of one, could be made to work. Even if it did, the feeding of steam at 900 lbs. per sq. in. pressure to a normal type of reciprocating cylinder was bound to produce lubrication and wear problems of some magnitude. Nevertheless the concept had appealed to a wider field and similar boilers, in addition to the original German one, were fitted to locomotives in France and Canada. Alas, in the first three weeks, while the engine was still running its first trials adjacent to the Glasgow works, one of the vertical tubes lining the firebox side overheated and burst, due to defective natural water circulation, killing an inspector. This ill-omened beginning was followed by much investigation and partial rebuilding of the boiler, so that the machine could eventually be brought to Derby, and testing continued. It was never entered into revenue service, however, because the boiler feed arrangements, having to deliver against so high a pressure, never permitted a reliable water level to be maintained. After a long period of idleness it made one last demonstration run after Stanier's advent, with no greater success. The chassis was eventually used as the basis of the first tapered boiler Royal Scot, No. 6170, turned out in 1935. Duffy, M.C. The Schmidt high pressure locomotive and its influence on American and European locomotive design. Trans. Newcomen Soc., 1991. 63, 103-32. Includes No. 6399. F.C. Lea of Sheffield University reported on the boiler failure which took place at Carstairs. Holt, Geoff. FURY... the experimental high pressure locomotive of the LMS. Backtrack LMS Special Issue No. 1, page 14. Ransome-Wallis, P. Unconventional forms of motive power in Ransome-Wallis, P. ., editor. The concise encyclopaedia of world railway locomotives. 1959. Pp. 461-77 (Chap. 9). Includes Fury. Stenning, H.A. Discussion on Gresley, H.N. High-pressure locomotives. Proc. Instn mech. Engrs, 1931, 120, pp 142-4. Pp. 142-4 : Stenning gave some details of the stress effects experienced in the boiler, due to excessive temperatures. Tee D.F. Notable recent L.M.R.withdrawals. Rly Obsr, 1963, 33, 36-7. Includes brief notes on Fury. Page .94] ...This was followed by the incursion of Class 6 4-6-0 No 6399 Fury at the depot. [Wellingborough] After Fury had undergone modification following the bursting of a high pressure water tube, part of the 'wall' of the firebox, near Carstairs in early 1930, when the Superheater Co's representative was killed and the railway fireman seriously injured, it ran further trials involving use of the dynamometer car and production of indicator diagrams. The trials were conducted on Sundays from Derby on the main line to London. I do not know whether it was the intention to project them beyond Wellingborough, but the first one certainly terminated there when the feed pump which fed the high pressure drum failed in the vicinity. On the following day, Frank S. Pepper visited the depot to examine the offending pump; he was experimental draughtsman in the locomotive drawing office at Derby and seasoned in the wiles of the locomotive, as he had been on the footplate when the fatality occurred at Carstairs. I was scraping a regulator valve at a nearby bench when Pepper, an extremely agile man, jumped from the footframing at the side of the boiler to the floor. In so doing he caught the ring on the third finger of his right hand in a split pin securing one of the joint pins of the indicator gear, stripping the flesh down to the second joint. The coppersmith rendered first aid, but Pepper declined the assistance of the wheeled litter which was the pride of the shed and suitably accompanied made his way to the cottage hospital, where the finger was amputated under a local anaesthetic. By this time the engine was beginning to earn an unenviable reputation; quite apart from its poor performance, it was viewed with a wary eye by all who had to do with it. On its 'next trial, which was to terminate at Wellingborough, I was brought on specially to uncouple the engine from the tender should it be found impossible to turn both together in No 1 shed's 55ft turntable. Total wheelbase of No 6399 was 52ft 9¼ in, but the difficulty was to balance the load on a table of an old design. I did, however, succeed in turning it in one piece. It was then recoupled to the dynamometer car ready for return to Derby, under the eye of Herbert Chambers, the Chief Locomotive Draughtsman at Derby. He chatted cordially about this highly unconventional locomotive, about which I had read so much. Suddenly there was a loud bang. Except the driver, we all moved away more quickly from the locomotive than, I suspect, we had moved away from anything for a long time. The first thought of the driver, a phlegmatic individual, was that another tube had burst; but nothing blew past the newly fitted balanced firedoor, which was contrived so as to close automatically if pressure built up in the firebox. By this time, seeing clouds of steam issuing from between the engine and tender under the footplate, we realised that it was only the intermediate steam heating hosepipe which had burst! Tufnell, Robert Prototype locomotives. Newton Abbot: David & Charles, 1985. 112pp. Chapter 6: succinct account which states that Fury must have travelled more miles under tow than under its own steam. This class was variously known as the converted Claughton, Baby Scot and Patriot classesthe last being the official name from about 1937: see L.M.S.R. "Baby Scots" to be known as Patriot class in Railway Gazette, 1936, 65, 634. The design grew out of the modifications incorporated into the LNWR Claughton class including a Derby-designed larger boiler in combination with the Royal Scot chassis. The first two locomotives incorporated LNWR wheel centres and bogies from the Claughton class. All enjoyed LNWR whistles. The next 40 locomotives did not even possess these LNWR parts (whistles excepted) (but see Powell Stanier locomotive classes where it is stated that the Jubilee class built at Crewe were fitted with Claughton bogies), but were known as rebuilds. It "Claughtons"  they were, more correctly, replacements. The contemporary literature is remarkable for its paucity. The Stanier/Fairbairn/Ivatt rebuilds are considered with the rebuilt Jubilee class.. Rebuilt "Claughton" locomotive, L.M. & S. Ry.. Loco. Rly Carr Wagon Rev., 1930, 36, 397. Reconstructed "Claughton" locomotives, L.M.S.R.. Rly Engr., 1930, 51, 489. illus. Reconstructed "Claughton" locomotives, L.M.S.R.. Rly Mag., 1931, 68, 46-7. illus. Powell noted that the 'Patriot' design evolved... from a marriage of the 'Royal Scot' chassis and the enlarged 'Claughton' boiler. The first two engines were perhaps classifiable as a rebuild of the 'Claughtons', since various components such as bogie, wheels, brake gear and reversing gear were used again. The next ten engines had new coupled wheels but were otherwise generally similar, while the remainder were almost entirely new engines with various detail differences. Now in principle, there was nothing wrong with such a design. The 'Royal Scot' cylinders and motion, while not quite up to the most enlightened modern standards, proved satisfactory over many years of hard-driven service, and superficially the boiler and firebox were of good size for the job. Yet somehow they just did not click together as they should have done, and the result was an engine that you had to handle understandingly and humour along: hammer it you could not. There were two reasons for this. Firstly the boiler tube proportions were wrong, and secondly the draughting was deficient. Ashcroft, Bill/ The 'Patriots': I remember them well. Steam Wld, 1995, (95) 46-9. Atkins, P. West coast 4-6-0s at work. 1981. Chap. 8. Atkins noted the greater reliability of the three-cylinder type. Weight tests showed that the locomotives approached the Royal Scot class in weight. The next forty locomotives were regarded as renewals and the first ten did incorporate Claughton axleboxes and the double radial trucks, The final batch of fifteen was regarded as new and were intended to be Nos. 6030-6044, but the last five were constructed as Jubilees. One of the great strengths of Atkins is that he shows the progress on from Claughton class to the Jubilee class. He notes that the valve gear and piston valves were interchangeable between the Patriot, Royal Scot and Jubliee classes. On page 86 there is an illustration of "No. 6005" with a Caledonian Railway pattern chimney and straight sided smoke deflector plates and with non-standard coupled wheel centres with solid webs. Further tests include those between No. 5551 against Jubilee No. 5556 between Wolverhampton and Euston in the Autumn of 1934 when the coal consumption of the Patriot was slightly higher. In similar tests in April 1935 against a Jubilee with a three-row superheater and one in its original state showed the superiority both of the Patriot type, and the modified Jubilee over the original Jubilee type. Clarke, John. West Coast engineman: Driver W.T. Starvis of Camden. Steam Wld, 1996 (110). 16-21. Clay, John F. Jubilees of the LMS. 1971. Edgington, Owen. Patriotic fervour [letter]. Backtrack, 2014, 28, 381. Photograph of No. 45519 Lady Godiva emitting very black smoke on climb out of Sheffield led to this letter which claims that this was normal for the class. Incorporates material written in response to the original J. Stephenson Loco. Soc. articles: Langridge worked alongside Jack Francis who was responsible for the boiler drawings. Langston, Keith. British steam Patriots. Barnsley: Wharncliffe Transport, Pen & Sword Books, 2011. 168pp. Chapter 8: 'Patriots' and 'Jubilees': partly based on article with same title written under 45671 pseudonym in Trains ill., 1958, 11, 142-8. Powell, A.J. Were the Patriots really necessary? Steam Days, 1992, 1 (34), 107-11; 330-1. Takes a more radical tack, than in earlier contribution by suggesting that a thorough aproach to removing the limitations from the potentially excellent Claughton class would have given far better value. Like the Patriot class this would have exploited the G9½S boiler on some of the locomotives. Robinson, E.E. L.M.S. locomotives: the Claughton and Baby Scot classes (complete to February 24th, 1934). Egham (Surrey), Author, . [ii], 10 p. + 4 plates. 4 illus. (Class book No. 1). Robinson, E.E. L.M.S. locomotives: alterations to "Claughton" and standard 5x class passenger engines. Egham (Surrey), Author,  4 p. (Supplement to class book No. 1to 6th October, 1934). Refers to locomotive making a dark exit from Sheffield: So poor old No.45519 Lady Godiva continues to receive the 'poor steamer' label. But let us not forget that. like her legendary namesake, she did have her moment of glory - on Shap, on Good Friday in 1951. Photographer Derek Cross described it as a "superb effort" and said "in all the many hours I have spent on Shap I have never heard or seen anything else like it. The still. sultry air vibrated and on the locomotive firing must have been continuous." The was when Lady Godiva hauled the fourteen-coach train No. W17. the combined 9.15am Crewe-Glasgow and Perth. up Shap, without the assistance of a banker (which had derailed). from a standing start at Tebay. He took a photograph to prove it. showing a tremendous column of smoke from the chimney. and this can be seen in Railway World. October 1971. and also in Locomotives Illustrated No. 27 along with his account of "one 'Patriot's' finest hour". Notes that the introduction of the classes more or less coincided with the Company's discovery of the need for publicity, and locomotives were exhibited at Liverpool, Manchester, Crewe, Glasgow and Dundee at various times between November 1927 and April 1928. This part is almost entirely concerned with the Royal Scot class.. In spite of silly title for feature (the weans were not manufactured in Glasgow!) the references for both classes are listed within a highly sensible classification: drawings and official photographs; contemporary accounts; retropsective accounts; performance (mainly from Nock); train services and names. The Patriot class was characterized by variations in bogie and chassis types, and only the last series were selected for rebuilding with larger boilers. The frames used for the Patriots were stronger than those for the Royal Scot class as they lacked the cut-outs for lightening. Furthermore, the cylinders were smaller and frame cracking was not experienced. The weight quoted for the Patriots was 83 tons 8 cwt as aginst 84 tons 18 cwt for the Royal Scots, but the CME had claimed 80 tons 15 cwt in the case of the former. Annual milegaes are quoted for both classes. Tee, D.F. Notable recent L.M.R, withdrawals. Rly Obsr, 1963, 33, 36-7. Includes notes to mark the end of the un-rebuilt type. Tuplin, WA. On the footplate over Ais Gill. Rly Mag., 1953, 99, 593-4. illus. Memories of a footplate trip which took place soon after 1930. DRIVING his own engine. Rly Gaz., 1943, 79, 532. illus. Driver W. Wood, V.C. with "Patriot" No. 5536 Private W. Wood, V.C. Field Marshal The Viscount Montgomery. Loco. Rly Carr, Wagon Rev., 1948, 54, 163. illustration. Higgins, Jeremy. Great War railwaymen. London: Uniform, 2014. Further information about the VC names: Private W, Wood VC (No. 5536) and Private E. Sykes VC (No. 5537) and the gallant actions by these men. LOCOMOTIVE naming ceremony at Euston. Rly Gaz., 1937, 66, 769. L.M.S. locomotive is named "Home Guard". Loco. Rly Carr, Wagon Rev., 1940, 46, 215. L.M.S.R. "Baby Scots" to be known as "Patriot" class. Rly Gaz., 1936, 65, 634. L.M.S.R. locomotive named "Home Guard". Rly Gaz., 1940, 73,129; 126. illus. L.M.S.R. "Patriot" class engine named. Rly Gaz., 1947, 87, 362. No. 5505 Royal Army Ordnance Corps. [Nameplate of Patriot class No.5500 Patriot]. Rly Gaz., 1937, 66, 910. 2 illus. [Nameplate of Patriot class No.5500 Patriot]. Rly Mag., 1937,81, 67. 2 illus. Naming ceremony at Euston. Rly Mag., 1937, 80, 462. No.5504 Royal Signals and No.5501 St. Dunstan's. New regimental engine: "Royal Tank Corps" named: Cambrai anniversary. The Times, 1937, 22 November. p. 19. illus. On Saturday 20 November Major-General Sir Ernest Swinton unveiled a nameplate and crest at Euston Station on No. 5507. W.A. Stanier welcomed the troops. Driver H.R. Prince and Fireman G.H. Sorrell had both served in the Royal Tank Corps: the driver had been mentioned in despatches three times during WW1. [Patriot class locomotive No. 45506 named The Royal Pioneer Corps.]. Loco. Rly Carr. Wagon Rev., 1940, 54, 163. illus. Private W. Wood. V.C.. Rly Mag., 1943, 89, 357. 2 illus. The driver with the locomotive named after himself. War Memorial locomotive, "Patriot", L.M.S.R.. Loco. Rly Carr. Wagon Rev., 1937, 43, 137. 2 illus. Transfer of the "Patriot" name from "Claughton" No. 5964 to "Patriot" No. 5500. Page 55 Mayor of Blackpool, Alderman Ashton, breaking bottle of champagne on 5524 Blackpool in March 1937. Page 8: 5543 Home Guard being named at Euston by Lt. Gen. Sir Henry Pownall, Inspector General on 30 July 1940. Churchward had produced his 28XX in 1903 for the haulage of heavy coal traffic: this was the Midland's response, but it did incorporate a superheater. The two initial locomotives differed slightly: No. 3835 had 20in x 26in piston valves and a Schmidt superheater, whilst No. 3836 had 19in x 26in cylinders and a Swindon superheater. These were tested against saturated 3Fs on Toton to Brent coal trains via Nottingham and Melton Mowbray; No. 3835 was found to be the best, but Midland tests appear to have been designed to show the desired outcome..
Batches of this type, which was a very slightly altered version of a Fowler 1911 design, were built by the L.M·S. until 1941. Tester's assessment appears to be significant..
L.M.S. standard 0-6-0, class 4, superheated freight tender engine. London, Virtue, [1935?]. folding plate. col. diagrs. & plan. Sectionalized diagram. Location : Manchester Central Reference Library. SUPERHEATER goods locomotives~London, Midland & Scottish Railway. Loco. Rly Carr. Wagon Rev., 1927, 33, 137-8. illus. Recorded that an LMS 4F 0-6-0 had been modified at Swindon with an improved blastpipe and chimney and that on tests on the North Wales main line the maximum continuous steaming rate had improved from 12,000 to almost 21,000 lb/hr. Powell was the arch critic of this extremely badly designed locomotive. Essery, Terry. How it was done. Part 2. Disposal. LMS Journal, 2005 (10) 54-68. The 4F class were difficult to dispose. Annual mileage statistics are quoted for the 4F for 1950: 21,823 miles. Essery, R.J. and Toms, G. The Midland 'big goods' and LMS standard class 4Fs. Br Rly J., 1987, 2, 428-35. Design originated with two experimental 0-6-0s with "larger" boilers in 1911: Nos. 3835 and 3836 The former was fitted with a Schmidt type of superheater, and the latter with a Swindon doublepass superheater. The two were tested against Class 3 saturated 0-6-0s between Toton and Brent between 24 June and 2 August 1912. No. 3835 was declared the winner and building of the Fowler masterpiece did not terminate until 1941. The authors note the faults in the ashpans and in the bearings, but they were considered to steam well. Tender varieties are considered. Illus. : No. 3835 in MR livery; No. 4130 with tail rod housings and in pre-1928 LMS livery probably at former LNWR location; "Stanier" No. 4578 with early "Stanier" tender; N0. 4040 newly built at Derby in 1936 with tall "Stanier" chimney and second-hand MR tender; 4562 with tall Stanier chimney and flat coupling rods on Derby shed on 7 November 1937; No. 3893 with tender cab (tender MR pattern) at Shipton on 14 August 1939; No. 4557 (ex-SDJR No. 57) with tail rods, capuchon on chimney and MR tender passing Upwey Wishing Well Halt having brought SDJR excursion into Weymouth; 4340 at Stockport in 1947; M4539 at Derby in June 1949; 43849 (MR tender lettered BRITISH RAILWAYS and short "Stanier" chimney; 43856 with BR chimney and low dome at Gorton on 9 July 1964; 44244 with diagonal stripe on cabside at Coalville depot on 15 September 1964. Hunt, David, Jennison, John, Essery, Bob and James, Fred. The standard class 4 goods 0-6-0s. LMS Locomotive Profile No. 10. Mel Holley (Steam Wld, 2008 (250) 66): "detailed, thoughtful and considered text" plus reproductions of 17 original engineering drawings, including two fold out general arrangement. KPJ this is presumably the definitive work on this miserable locomotive type. Powell, A.J. Living with L.M.S. locomotives. 1977. Chapter 4 The Fowler legacy: The boilers in themselves were not bad, despite the use of a single set of flanged plates and standard tube layout for all fireboxes between 7ft and 9ft long. The ratio of free gas area to grate area suffered with the bigger grates, but surprisingly it seemed to make little difference at any normal steaming rates. The Belpaire fireboxes were straight, slab-sided affairs, but at the relatively low working pressures were not particularly troublesome for the boilersmiths. The flat-bottomed smoke-boxes were not always easy to keep airtight, however. The front tubeplate was riveted on to an angle on the end of the barrel, with rivets in tension, which was less desirable than a circular drum-head tubeplate set into the barrel, but apart from the need for some recaulking at the seam it appeared reasonably satisfactory. What was bad was the sheaf of internal pipes referred to in Chapter 2. There was no steam manifold on the firebox, as most railways used. Instead, internal copper pipes ran from the dome to facings on the backplate for the two injector steam valves, the small ejector steam valve, and the blower/sanding valve, and to a facing near the front of the boiler barrel for the large ejector steam valve. From the backplate, internal pipes also ran from the two clackboxes to delivery points near the front tubeplate, and from the blower valve to a connection on the front tubeplate by the superheater header. All these pipes threaded their way between the firebox crown stays in a rather haphazard manner, and for those carrying steam any chafing leading to ingress of water brought major problems, usually involving special shopping of the locomotive and removal of a block of tubes in order to get access. Certain Midland standard boiler fittings were poor in the extreme. Perhaps the most important were the live steam injectors, which were perpetuated on all new construction until after World War II. They were frequently temperamental starters, and had little range of delivery: there was usually only one position of the water handle where they would work at all cleanly. The vacuum ejectors were not very efficient, particularly if boiler pressure was at all down. The steam sanding valve was combined with the blower valve in a body always placed just above the firehole, out of reach of the driver. If there was a blowback, the blower was virtually inaccessible to anyone! And the combined vacuum/steam brake valve! It was supposed to give a graduated steam brake application on engine and tender matching the reduction of vacuum in the trainpipe, but in practice was one of those all-or-nothing affairs. To operate the steam brake on the engine when running light, without vacuum, you had to hook the linkage back manually for release of the brake. So everyone used vacuum, although there was no vacuum brake as such on the engine or tender. Nor must we forget other aspects of the driver's environment. On the passenger engines, the reversing screw had to be perched on top of the rear wheel splasher inside the fairly narrow cab. That left nowhere for the driver to sit, except on top of the reversing screw - on a wooden board, with a slot down the middle through which the cutoff indicator (equally spaced 'notches' with no percentage markings) was visible. I've heard of 'driving by the seat of the pants', but that was ridiculous! Then, except on the Compounds and some of the LMS-built locomotives, a plain regulator handle in the top quadrant meant that the driver had to stand up to open or close it. Hence the proliferation of front cab windows; imagine shunting a yard on that basis, standing up looking over or round the firebox to catch a glimpse of the shunter's hand signal! There were' drivers who carried round a home-made attachment which they fitted to the regulator handle with wing nuts so that they could operate the regulator and look out of the cab side at the same time. * Oh, yes, and the whistle handle was also central above the firebox, so you had to stand to operate that, also. So let nobody suppose that Midland engines were fun for the driver, quite apart from the indifferent protection that the cab offered. On the Class 4Fs, when running with the damper open (there was only one, at the front) a fine stream of ash from the ash pan was driven by the air flow to come up through various gaps, holes and slots into the cab at the back of the firebox. That made things even better! But the in built weaknesses of design, notably in the frames and axleboxes, meant that 50,000 miles between intermediate works repair was very good going - 40,000 was more typical of many of them - and they could be pretty rough by then. A run-down Compound on an express coming down the curves of the Peak Forest line from Millers Dale to Rowsley was an experience that you did not necessarily want to repeat! Some steps were taken to try to improve the hot box record, but they achieved little because the journal sizes could not be changed. There was some changeover to cast manganese bronze boxes, using dovetailed gun metal inserts and poured whitemetal between, them. But not qnly did these inserts loosen under the pounding meted out to them in service, thus leading to the breakup of the whitemetal, but from time to time part or the whole of one leg of an axlebox would break off either through a spring link hole or at a section weakened by a dovetail slot. Then some axle boxes of the Stanier type, in cast steel with a pressed-in brass, were fitted, notably to the Class 4Fs, and while mechanically satisfactory did nothing to overcome the problem of journal size. The 4Fs  everyone at Derby knew them as the 'Big Goods'! - had another endearing habit, that of snapping off outside crankpins, usually the driving ones. The coupling rod journals were, if I remember rightly, no more than 3¾ in diameter, and if the engine got into anything of a slip when pulling hard and then one pair of wheels got a grip to stop it, off would come a crankpin like a crisp carrot, more or less flush with the wheel boss, and showing a sizeable fatigue flaw. The answer was plain to see - bigger pins. But that would have required 'new coupling rods, and the cure would probably have been more costly than the disease. Right hand drive, Midland style, was retained on the first order, but thereafter the Derby built engines were to the future LMS standard left hand drive. These had shorter chimneys and domes, Ross Pop safety valves and a new pattern of straight sided tender. Nos 4432-6 had Owen's double beat regulator valve. Experimental use of Swirlyflo tubes on No. 44203 and their evlaution in tests between Crewe and Holyhead: see p. 107. Rutherford, Michael. Masterpiece of mediocrity: the 4F saga. (Railway Reflections 54). Backtrack, 1999, 13, 320-9. Following two prototypes built at Derby in 1911, which simply amounted to being superheated Belpaire developments of wet steam round-topped Iohnson Midland Railway Class 2 and 3 inside cylinder 0-6-0s built between 1875 and 1908, no fewer than 770 Class 4 0-6-0s were all built to the same drawings, incorporating only minimal modifications, for the Midland and LMS Railways between 1917 and 1941. Castigated by E.S. Cox and dubbed 'masterpieces of mediocrity' by Michael Rutherford in these columns (June 1999), their alleged deficiencies were a propensity to cracked frames, inadequate axleboxes and fickle steaming. In what virtually amounts to a PhD dissertation the author addresses each of these claims in scholarly engineering detail and makes the case for these once ubiquitous locomotives, several of which survive in preservation. Class 4 0-6-0s were built in four different railway workshops and by four different commercial locomotive manufacturers. Apparently the 25 built in Kilmarnock by Andrew Barclay & Co. were early noted to be particularly prone to frame cracks which, other things being equal, suggested that this was most likely down to the steel employed in this batch. No fewer than 82 pages alone are devoted to the question of axle box design and performance, with erudite discussion of lubrication techniques. The Class 4s as built were all provided with a simple parallel chimney liner, with no bell mouth, which was cast integral with the chimney. This would appear to have given satisfactory results in its original form, but when shorter chimneys were specified by the LMS in order to confer wider route availability, particularly in Scotland, steaming then became more problematic. When it had became almost too late to really matter, in 1954 (when the first MR-built locomotives began to be withdrawn) experimental revisions to the smokebox draughting arrangements by British Railways produced a dramatic 60% in boiler maximum evaporation rate, from 12,000 to 19,000lb/hr, which also represented an exceptional rate per square foot of grate area by usual British standards. The author is particularly good at setting the Class 4 in context with other large British 0-6-0s, including the even more ponderous and shorter-lived Gresley LNER Class J39, but he also makes reference to overseas designs. He also discusses the numerous attempts by the LMS over many years to produce a replacement/successor, several of which remained 0-6-0s and still with inside cylinders, but equipped with taper boilers. At literally the eleventh hour, in 1947, it brought forth H.G. Ivatt's ugly Class 4 outside cylinder 2-6-0, which the author does not rate unduly highly by comparison. By its own terms of reference this book is not a definitive history of its subject, nor is it for the faint hearted, but it gives considerable food for thought. Tester's study is very extensive, but his conclusions (pp. 271-4) make it very clear that frame performance in terms of fractures was not markedly worse than on many of the Stanier classes which had been designed to eliminiate this failing (there is a hint that Cox may have used the class as a scapegoat). Similarly, axlebox performance, especially proneness to hot boxes, was not especially poor and that much was due to false economies made by the use of low grade lubricants and poor workmanship and low qualiity metals. See The Locomotive, November 15 1930, page 391. CAB comfort. Rly Mag., 1945, 91, 236. Criticism of the riding qualities of L.M.S. locomotives, especially the 4F class. W.M. Smith, chief draughtsman at the Gateshead Works of the North Eastern Railway, invented a system for compound expansion which utilized one high pressure cylinder coupled to two low pressure cylinders. The system was experimentally employed on three North Eastern locomotives. In 1902, S.W. Johnson introduced the Smith principle on two new Midland 4-4-0s. Three more locomotives were built in the following year. For a further series of forty, R.M. Deeley modified the design by incorporating a larger boiler and by introducing changes in the cylinder and valve gear layout. From 1914 both series were fitted with superheated boilers. This final version acted as the basis for the 195 locomotives built by the L.M.S. from 1924. O.S. Nock has produced a very detailed study of the class. Sources are quoted. Some previously unpublished data is incorporated, which came from the files of R.C. Bond and A.E. Robson. D.F. Tee's R.C.T.S. monograph is much smaller than Nock's book, but it contains much concisely presented information, within the confines of 24 pages. Although Nock has collated much previously diverse material it should be noted that E.L. Diamond's "An investigation into the cylinder losses on a compound locomotive isa searching analysis of the design, written by a locomotive engineer. Other professional studies were presented by T.H.Shields and G.W. McArd. Terry Essery gave a very affectionate appreciation of the type and emphasized the largeness of the boiler: its grate area (28.4 ft2) slightly exceeded that of the Schools class. McKillop's tribute is especially noteworthy..
NEW compound express locomotives, London, Midland & Scottish Ry. (Midland Division). Loco. Rly Carr. Wagon Rev., 1924, 30, 103. illus. New three cylinder compound locomotives, L.MS.R.. Rly Mag., 1924, 54, 290. illus. Oil-burning locomotives on the London, Midland & Scottish and Southern Railways. Loco. Rly Carr. Wagon Rev., 1926, 32, 207-8. illus. This event was a publicity venture to offset the impact of the L.N.E.R.non-stop "Flying Scotsman". photographs shows 4P compound No. 1054 atShap summit with Edinburh portion with steam blowing off and clearly toying with its six coaches. Bond, R.C. in discussion on Gresley, H.N. High pressure locomotives. Proc. Instn Mech. Engrs., 1931, 120, 167. In his opinion the L.M.S. engines owed their outstanding success primarily to the simplicity of their design and to the fact that there was very little possibility of their being handled other than was intended by the designer. Brewer, F.W. The L.M.S.compounds. Engineer, 1933,155, 421-2. 3 illus. Considered that the LMS compounds were ""wonderfully successful engines" that they did not feature any "gadgets"; the success of Deeley's reducing valves and the "love of the British engineer for simplicity"
Diamond, E.L. Compound locomotives : their practical economy and disadvantages. Rly Engr, 1931, 52, 430-2. 8 diagrs. Diamond, E.L. An investigation into the cylinder losses on a compound locomotive. Proc. Instn mech. Engrs, 1927, 112, 465-79. Disc. : 480.517. For comments on this paper see Diamond page which incorporates observations made by Cox. Diamond, E.L. Development of locomotive power at speed. Proc. Instn Mech. Engrs., 1947, 156, 404-16. Disc. : 417-43. Theoretical analysis based upon a number of locomotive types, of which rebuilt Royal Scot and the 4P compound were the sole British examples: the remainder were either North American or Continental European (Chapelon) as above..
Fowler, H. Discussion on Fry, L.H. Some experimental results from a three.cylinder compound locomotive. Proc. Instn mech. Engrs, 1927, (2), 923-54. Disc. : 955-1024. Fry was describing a Baldwin experiment. On pp.955-61 Fowler gave details of compound locomotive performance on the LMS. Hall regards Webb's compounds as a millstone, but regards the Johnson/Smith Midland compounds as a milestone. Nevertheless W.M. Smith was not as Hall states on page 11 "an old Derby man" (but his son J.W. Smith who worked at Derby) and the zenith of Smith's work was achieved on the NER with locomotives which were presumably superior to those developed at Derby. Sadly, although Hall hints at the validity of the trials conducted by the LMS, he shelters behind Bond's comments made in A lifetime of locomotives where he stated that the tests "established beyond question the superiority of the compounds over all other contenders". .
Hodgson, James T. and Lake, C.S. Locomotive management: cleaning, driving, maintenance. 9th ed. London: St Margaret's Technical Press, 1948. 512pp. 294 figures (mainly diagrs.). Chapter 10 on Compound locomotives is in effect an excellent guide to the LMS 4P compounds with highly informative diagrams and reasons for and against compounding..
McArd, G.W. Locomotive compounding. Rly Gaz., 1956, 105, 351-3. 2 illus., 2 diagrs. (REA 10592). A review of world development, but with emphasis on the LMS type. McKillop, N. The lighted flame. 1950. Possibly the best welcome given to a 'foreigner' on the new L.M.S. was handed out to the Midland Compounds. It is quite true to say that I have never heard a disparaging word said about this remarkable type. I have marvelled at their smoothness. They ran like greased silk, with unbelievable loads for the size of the engine. New L.M. & S.R. locomotives. J. Instn Loco. Engrs, 1928, 18, 2-6 + 5 folding plates. 2 illus., 2 diagrs. (s. els). 4 tables. Includes test results of dynamometer trials over Shap. Nock, O.S. The Midland compounds. 1964. Chapter 4 The Fowler legacy: The frames, cylinders and brakes of the compounds were a positive dog's breakfast. Each frame plate was in three pieces: a rear section to the usual motion plate position, then a middle section forked at the front end to accept the three cylinders as a unit, and finally a front" section similarly forked at the rear end to lap with the middle section and the cylinder flanges. The front section was shallow and weak, and invariably crumpled, together with the gussets, at the least impact - they were nearly as mu'ch in the furnace for straightening as they were in service. A deeper profile was later adopted, and this made some improvement. The cylinders were pretty dreadful  small wonder that the thermal efficiency of the Compounds was no better than that of a modern simple. There was a piston valve below and for the HP cylinder, short on travel apd badly ported, and vertical slide valves for the two LP cylinders. The lubrication of the slide valves was never very satisfactory, despite trials with atomisation of the oil, even though the steam temperatures which they endured were low, and this led to very heavy scoring of the valve faces. In addition, the cylinders themselves were rather prone to fractures. So after World War II a decision was taken to change over to cast steel cylinders with cast iron liners, and the steel foundry at Crewe, whose products at that time were not notable for quality or homogeneity, had the time of their-nlives. It would be an understatement to say that this change was not a success: the internal ports and passages were so tortuous that it was extremely difficult to clear reliably the core sand from them and fettle them effectively. As a ,result the scoring of the LP valve faces got steadily worse, to the point where engines were being shopped at 20,000 miles, and in some cases much less, for remachining of the port faces. But the steam brakes on the Compounds were quite notorious. On: each side a steam brake cylinder was suspended betwe,~n the coupled wheel brake hangers, with an uncompensated clasp arrangement of rigging, and a metal hose steam connection which was most unreliable. Drivers had to watch the brake like a hawk when working light engine, getting it well warmed up before needing to use it, and even then it was as weak as dishwater. And duHng the war they tried to use, them on unfitted freight trains! With the LMS versions of the Midland designs, there was some 'cosmetic' treatment of chimneys and d'omes, and improved tenders~~ but that was just about all. A half-hearted attempt was made to improve the front end of the Class 2Ps, but it did not lead to much. The cylinders were reduced in diameter and the boiler pressure increased to compensate, but the cylinder layout remained just as poor. Double headed piston valves were applied in an attempt to get' the steam through better, and they wereirriarginally better in this"respect, but the valves were much more difficult to fit, and even worse to get out, for they suffered severely from carbon build-up. O/5938 was placed for twenty new superheated compounds Nos 1045-64, having driving wheels of 6ft 9in diameter but being otherwise similar to the Midland engines except for a ¾in increase in the diameter of both high and low pressure cylinders. This order was completed by the Derby shops between February and July 1924, and was followed by another O/6066 for twenty further engines to work on the Northern Division, to be numbered 1065-84, delivered between July and December of the same year although only 1065-9 actually went to the Northern Division. These were basically the same as the first batch, but had shorter chimneys to clear the lower loading gauge in Scotland, and were provided with Ross Pop in place of Ramsbottom safety valves, although retaining the lock-up valve behind. A further batch of thirty compounds, this time with left hand drive was constructed to O/6293 between May and December 1925. These were numbered 1085-1114, and in the light of experience gained with the working of the previous batch which had proved to run less well with the larger cylinder, the size was reduced back to 19in and 2lin for high and low pressure respectively, but the reduced size of driving wheels was retained. The new compounds were dispersed to many parts of the new LMS system, some going to Camden, Rugby, Longsight and Kingmoor while the remainder of the first two orders were retained on the Midland Division. Of the third batch most were also kept on the Midland lines except for Nos. 1110-14 which went to former LNWR sheds. In Scotland they were well liked. Compared with the LNW and Caledonian 4-6-0s they had very real advantages in coal consumption rates burning 34lb per mile as against 44 and 52 respectively, the lb/drawbar hp per hour figures being 4.06, 5.07 and 5.19 respectively. A further series of comparison tests carried out in November and December, 1924 proved decisively the superiority of the performance of the Midland comp6und over other existing designs. They were LNWR Claughton four-cylinder simple 4-6-0 No 2221, Caledonian superheated 4-4-0 simple passenger No 124 and three compounds, Nos 1065 and 1066 with 6ft 9in coupled wheels and 1023 with 7ft coupled wheels. The route chosen was the hard graded line from Leeds to Carlisle with both 300 and 350 tons trains and the results proved that, while there was very little difference in the average drawbar hp between the Claughton and the compounds, the former consumed 29 per cent and 21 per cent more coal per ton mile than the latter for the 300 and 350 ton trains respectively while the Caledonian engine consumed 42 per cent more on the lighter trains. The steaming of the compounds was regarded as satisfactory throughout the tests whilst the Claughton was quite the reverse, and in efforts to keep time the enginemen allowed the water to go very low in the glass in order to conserve the steam pressure., The Caledonian engine steamed well with the lighter train but the general performance was stated to be "not satisfactory". The conclusions were that while the Claughton proved itself a very free running engine it had heavy coal and water consumption and also a very poor steaming boiler. The Caledonian engine steamed well but engine performance was not satisfactory. The compounds were regarded as giving the best and most economic performance, .and were therefore selected for future building programmes. Reynolds, W.J. The Midland compounds. Railways, 1949, 10, 29-30. illus. Noted that the class had the largest grate area on any British 4-4-0 and the locomotives were as powerful as any of their type outside America and added that the maximum sustained power outputs achieved by the Midland Compounds, Southern Schools, LNWR George V and LNER Shire (D49) 4-4-0s were all much the same, but the Midland and LNER types were rarely required to produce such outputs. Robinson, E.E. L.M.S. locomotives : the standard 3-cyl. 4-4-0 compound passenger class. Egham (Surrey), Author, 1935 . 18 p. + front. + folding col. plate. 2 illus., 5 diagrs., plan (Class book No.2). J. Clayton (237) noted that the Smith type used on the Midland compounds were not very steam tight. E.C. Poultney (238) supported Clayton's assertion and considered that piston valves were not suitable for low pressure cylinders. Selby, F.W. Compound locomotives. J. Instn Loco. Engrs, 1930, 20, 287-316. Disc. : 317-24; 693-703. + 12 folding plates. 6 illus., 12 diagrs., 3 tables. (Paper No.257). Shields, T.H. The steam locomotive and its future in relation to electric traction. J. Instn Loco.Engrs, 1926,16, 315-27. Disc. :327-52; 498-501.diagr. (s.el.) (Paper No.194). An appendix (pp. 338-41) gives generalized details of performance over the Beattock and Ais Gill routes. Smith, D.L. The work of the L.M.S. compounds in Scotland. J. Stephenson Loco. Soc., 293-309. 12 illus. Addenda by O.K. Douglas and G.M. Keiller pp.367-9. Includes general introduction to ccompounding in Britain then conncentrates on 4P workings. Tee, D.F. The Midland compounds. RCTS, 1962. Obituary of David Tee (born Coventry, 1928) Midland Record (16), 13. Tester, Adrian. An introduction to locomotive testing: traditional locomotive testing techniques. Part 2. Backtrack, 2011, 25, 41. Tests conducted on the Somerset & Dorset Joint between Bath and Bournemouth and return in December 1924 compared compound No. 1065 with simple No. 67 (equivalent to MR 483 class 4-4-0 simple) in which the compound did not appear to out-perform the 2P due to its inability to develop sufficient tractive effort at lows speeds..
Tomkins, R.M. The Midland Railway 4-4-0 three-cylinder compound locomotives and later developments. J. Stephenson Loco. Soc., 1954, 30, 190-9; 354. 2 illus. (line drawings : s. el. ), 2 tables. Tuplin, W.A. The Midland compounds. Railways, 1952, 13, 34-6 +. 2 illus., table. A descriptive, rather than critical, article. "Voyageur", pseud. The last of the Midland compounds. Trains ill., 1961, 14, 674-7. 5 illus. LMS No. 1111 in LMS crimson lake (colour) in Haresnape, B. Railway liveries: London Midland & Scottish Railway. London: Ian Allan, 1983. Fowler renewed the Johnson 4-4-0s beginning with No. 483 and fitted them with superheated boilers. From 1928 this design was adopted by the LMS for new construction..
Midland Ry. Locomotive Mag., 1913, 19, 27. illus. Hunt, David, Essery, Bob and James, Fred. Midland Engines No.3  The Class 2 Superheated 4-4-0s. Wild Swan. Hunt, David. Superheater class 2s in service. Midland Record (14), 5-9. During the 1880s Johnson, of the Midland Railway, introduced several classes of 4-4-0 locomotives. From 1912, Fowler rebuilt most of these engines with superheated Belpaire boilers and piston valves. In 1928, Fowler introduced the class under consideration, which was similar to the earlier rebuilds, except for some modifications to the cylinder arrangement. The locomotives were used for light secondary duties and as assisting engines. See Cox (below) for assessment. They also formed the main passenger motive power on the Somerset & Dorset line, for several years. Two locomotives were fitted with feed-water heaters. 1933: Dabeg feed-water heaters were fitted to two locomotives. L.M.S. 4-4-0 engine with Dabeg feed water heaters. Loco. Rly Carr. Wagon Rev., 1934, 40, 52. illus. "Even the most rabid Derby-ite could not but acknowledge that the Midland Class 2 engine was not very bright...Indiciator diagrams in the shape of very thin bananas showed severe throttling at both inlet and exhaust, and were a sign of a thoroughly constipated front end." He then compared this type with the Maunsell/Clayton rebuilt SECR 4-4-0s of classes E1 and D1 and wonders what would have happened if an LMS 2P had been set to run a heavy boat train (not the sort run from St Enoch to Ardrossan for the Arran boat). 2P 4-4-0 working on Glasgow & South Western section. Nock, O.S. A famous 4-4-0 design : its origin and standardisation. Trains ill., 1950, 3, 129-33. 6 illus. Rough, E., compiler. Particulars of L.M.S. locomotives : 4-4-0, class 2. Rly Obsr, 1935, 7, 112. table. Boiler numbers, engine numbers, tender numbers. Radford Derby Works and Midland locomotives (page 149) noted that experiments took place with valve gears durring 1910-11 when two 4-4-0s, 382 and 387, were fitted with Isaacson's and MR-modified Stephenson's respectively, for comparison purposes with standard gear equipped 379. The standard valve-gear showed up best in coal consumption figures at 34.81b per mile compared with 35.0 and 35.31b per mile respectively for the Isaacsons and the modified gears, although water consumption was slightly higher. This Beyer-Garratt design was introduced to obviate double-heading on the Toton marshalling yard to London coal trains. Cox (Locomotive panorama, v.1) has shown that the locomotives were built with bearings of inadequate size and short travel valves. In consequence the class did not achieve high mileages between overhauls. Nevertheless, the 45,620 lbf tractive effort ensured that double-heading of the coal trains was eliminated. From 1930 most of the class was equipped with revolving coal bunkers to save the fireman having to carry fuel from the rear of the engine. GARRATT locomotives for the London, Midland & Scottish Railway. Rly Mag., 1927, 61, 24-5. illus. "GARRATT" patent locomotives (2-6-0 + 0-6-2 type) for the London, Midland & Scottish Railway Co.. Loco. Rly Carr. Wagon Rev., 1927, 33, 176. illus. 1930 : Revolving coal bunkers and other slight alterations. Beyer-Peacock self-trimming coal bunker. Loco. Rly Carr. Wagon Rev., 1931, 37, 119-21.3 illus. A detailed examination of the special bunker. NEW Beyer-Garratt locomotives, London, Midland & Scottish Railway. Loco. Rly Carr.Wagon Rev., 1930, 36, 330. illus. NEW Beyer-Garratt locomotives, London, Midland & Scottish Railway. Rly Engr. 1930, 51, 373. illus. GARRATT locomotives in service: some notes on the performance of these engines with heavy freight trains of 1 ,500 tons total weight on the London, Midland & Scottish Railway. Rly Engr. 1927, 48, 464. 2 illus. 1932: F. Burton, a railway enthusiast, noted a 2-6-6-2T hauling a 16 coach test train, near Market Harborough. Un-titled reference: Rly Mag., 1932, 71, 230. 1934 : A Garratt was used experimentally on the Lickey incline as noted in a paragraph : Rly Mag., 1934, 74, 229. See also L.T. Parker (below). Armstrong, Sam. The inglorious Garratts. Steam Days, 1995 (72), 487-96. Recounts the development of the Beyer-Garratt type, the involvement of James Anderson and his insitance on undersized axleboxes and short travel valve gear, the difficulties of hand-firing such large locomotives. The axle-weights were absurdly high. Beyer Peacock designed the rotary bunkers which relieved the firemen of some of the effort. Problems with failures of rotary bunkers, exhaust steam injectors, time to fill the water tanks and maintenance which was accerbated by a shortage of spares. Some consideration is given to further Garratt designs for the LMS/BR. Beyer Peacock & Co. Ltd., Manchester. Beyer-Garratt articulated locomotives. London, Beyer Peacock, 1947. xvi, 164 p. + 2 folding plates. 199 illus., 8 diagrs. Pp. 118-23 describe the L.M.S. locomotives. "The writer's only personal experience of the engines reviewed was the erection and running in of most of the second batch of Garratts in 1930. At the time it seemed strange that they were built without inner carrying wheels, giving very heavy loading of the rather undersized axleboxes and probably adding to flange wear. Admittedly, the axleboxes were not so severely loaded by piston forces as in the case of the inside cylinder 0-6-0 Class 4 engines. The use of the short travel valve gear seemed then, as now, quite inexplicable, especially in the second batch of engines." Together with Russell Cropper, an erector with Beyer Peacock, travelled with the new Beyer Garratts to the LMS at Derby, completed their erection and introduced them into service and in the process experienced incidents which might have been serious due to the lack of experience by the footplate crews. Considered two Garratt designs: the huge three-cylinder type for the New Zealand Government Railways which were far too big and ended up being rebuilt as six 4-6-2s and the highly unsatisfactory locomotives ordered by the LMS (Carling was involved with the second batch at the delivery stage).. In the case of the LMS locomotives much of what was said above is repeated, notably the inadequate axleboxes. In addition it is noted forcefully that the footplate crews were not trained in how to handle these monsters and no attempt was made to relate the locomotives to the existing infrastructure. Time was wasted filling up the locomotives with water, for although twin water cranes were common place for double-headed trains the filler openings on the Garratts did not conform to these distances. Further the front opening was difficult to see from the footplate. The hump at Toton had to be modified as the Garratts could not cope with the vertical curvature. There were also problems with curvature at Derby Works. The maximum axleload was 20.25 tons which must have been well in excess of that tolerated on the Midland section (KPJ). Fianlly Carling noted that the contract was initialled by Anderson. Carling also questions why a 2-6-2+2-6-2 layout was not adopted and why the Horwich 2-6-0 was not used as the basis for the engine. . Chambers, H. Discussion on Williams, W.C. Modern articulated steam locomotives. J. Instn Loco. Engrs, 1933, 23, 85-132. Disc. : 132-57. (Paper No.299). Pp. 139-40 : Chambers gave details of the origin of the revolving coal bunkers. Durrant, A.E. Garratt locomotives of the world. Newton Abbot: David & Charles, 1981. States (page 31) that 21 ton axle load was highest of any Garratt built and equivalent tractive effort could have been achieved with a large 2-8-0 with similar axle load. Elliott, J.S. Discussion on Williams, W.C. Modern articulated steam locomotives. J. Instn Loco. Engrs, 1933, 23, 85-132. Disc. : 132-57. (Paper No.299). J.S. Elliott (148-50) described the performance of the LMS locomotives in service. They were unsuited to variable traffic and repairs may only be needed to part of the locomotive. On the other he praised the large dimension boiler, its good steaming and deep firebox, its high tractive effort, its low axleload, the flexibility of the units and their ease on the track, but wanted a sharper blast and mechanical stokers. There were problems with tube cleaning, the location of the sand boxes and wear of the crosshead slippers and a wheel drop is essential. There was a good reduction in flange wear.Wagon design and siding limitations restricted their use in Britain. Essery, R.J. and Toms, G. LMS & LNER Garratts. Didcot: Wild Swan, 1991. Contains extensive tabulated data: follow up in British Railway Journal (68)page 103. Whilst the rotating bunkers on the Beyer-Garratts were a great help to firemen, they were difficult to coal, and the covers were very difficult to open and close. Extinct locomotive classes: L.M.S.R. Beyer Garratt 2-6-6-2 class. J. Stephenson Loco. Soc., 1958, 34, 115-17. table. Last British Railways Garratt. Rly Mag., 1958, 104, 438-9. illus. The L.M.S. Beyer-Garratts. Trains ill., 1959, 12, 122. The L.M.S. Garratts. Rly Obsr, 1958, 28, 129-30 + plate. 2 illus. The above three references are of the "obituary" type. Includes notes on the 1934 experiment..
Patrick, David discussion on Hills, R.L. Some contributions to locomotive development by Beyer, Peacock & Co. Trans Newcomen Soc., 1968, 40, 120-1. Includes a full list of locomotives manufactured. Highly detailed on Beyer Garratt development. In discussion Patrick (p. 120) is highly critical of rotary bunker fitted to LMS Garratts (far better to have fitted mechanical stokers) and on p. 121 he noted that in 1926 Beyer had designed a Beyer-Garratt for Mauritius which was virtually the same total wclght as the LMSR Garratts; it was a 2-8-0+0-8-2 with a much reduced axle-loading. A detailed comparison of these two designs left no possible doubt that, if Beyer Peacock had been allowed to design the LMSR Garratt, the LMSR would have had a much better engine than they got by harking back to Kirtley. Chapter 10 The strong pull. (originally Trains ill., 1958, 11, 600-6) notes that the "Garratts were really dreadful engines" with ultra-short travel valve gear and under-sized axleboxes. Tester, Adrian and Hunt, David. Setting the record straight. Steam Wld, 2009, (270) 24-8. Williams, W.C. Modern articulated steam locomotives. J. Instn Loco. Engrs, 1933, 23, 85-132. Disc. : 132-57. (Paper No.299). A world review of development. In view of the Sevenoaks accident involving the Maunsell K, or "River", class 2-6-4Ts, 1927 would seem to have been an inauspicious time the introduction of a new 2-6-4T. Rowledge Maunsell Moguls notes that Fowler checked with the Inspecting Officer for the accident before permitting construction of the LMS design to go ahead. In actuality the class was very successful in service, mainly due to the use of long-lap valves, and was the one of the few Fowler designs used by Stanier as a direct basis for his own developments. Stanier only changed the boiler type when introducing his standard 2-cylinder tank engine. See also W class of NCC. The LMS Locomotive Profile No. 3 is a very thorough account: it includes a folding general arrangement drawing, and full details of liveries (some of the early locomotives were painted in crimson lake, and must have looked superb). On pp. 6-7 the influences on the design are considered: it is argued that it was A.E. Owens and Jock Henderson who were responsible for the long lap, long travel valves. The pony truck came from the Schenectady 2-6-0s and was of the Bissel swing link type. New L.M. & S.R. locomotives. J. Instn Loco. Engrs, 1928, 18, 2-6 + 5 folding plates. 2 illus., 2 diagrs. (s.els. ), 4 tables. New 2-6-4 tank locomotives, London, Midland & Scottish Railway. Rly Mag., 1928, 62, 208 + plate.f.p. 171 ilIus. 2-6-4-type locomotive; London, Midland and Scottish Railway. Engineering, 1928, 126, 744-5. illus., 9 diagrs. Stanier was responsible for three versions of this design, which originated in 1927 under Fowler. The first Stanier version was introduced in 1933 and was the Fowler design, modified with a side-window cab and doors. This type was also the subject of experiments in welding. In 1934 a three-cylinder taper-bailer class was built for the Southend line, which was followed in 1935 by a taper-boiler variant of the two-cylinder Fowler locomotives. L.M.S. tank locomotive. Engineer, 1933, 156, 406. illus. NEW 2-6-4 type tank locomotives, L.M. & S. Railway. Loco. Rly Carr. Wagon Rev., 1933, 39, 317. illus. (a parallel-bailer locomotive with modified cab) incorporated a number of welded parts, notably the cylinders and pony truck. The Stanier paper is a general review of British activity, but it, naturally reflects this particular experiment. ELECTRICALLY-WELDED cylinders for 2-6-4 type tank locomotive L.M.S.R.. Engineering, 1934, 137, 551. 3iIlus. FABRICATED locomotive cylinders. Engineer, 1934, 157, 477. 3 illus. FABRICATION of locomotive components. J. Instn Loco. Engrs, 1934, 24, 153-6. 4 illus. Notes on welding in locomotive workshops. Loco. Rly Carr. Wagon Rev., 1934, 40, 258-62; 283-4. 3 ilIus., 8 diagrs. Stanier, WA. Welding in British railways (mechanical engineering) [in: IRON and Steel Institute Symposium on the welding of iron and steel. London, Iron and Steel Institute, 1935. See v. 1 pp.349-56 + 6 plates. 36 illus. and the general discussions pp. 409-26 and 424-5. Hunt, David, Essery, Bob and James, Fred. The parallel boiler, 2-6-4 tank engines. 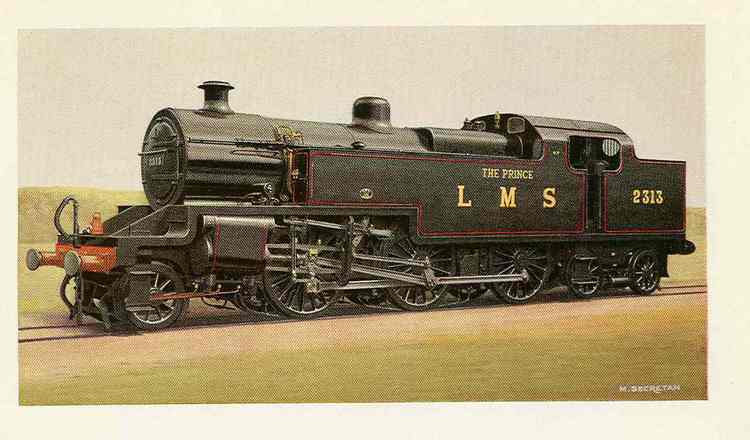 LMS Locomotive Profile No. 3. Further information LMS Journal (9), 35-40. Extremely detailed especially in the large number of detailed working drawings included (there is even one folding diagram (printed on both sides). Moderately strong on livery, although a colour pate might have helped. There is a list on the locomotives painted in the original crimson. There is an infuriating black & white picture of No. 42394 at Leeds City on 8 July 1964 allegedly painted green, but Backtrack, 2005, 19, 610 shows same locomotive at Halifax on 1 November 1965 in colour in what is quite clearly dirty black..
Essery, Terry. Steam locomotives compared. Penryn: Atlantic, 1996. 160pp. Found the class to be very very free-running, fast and steady. Frank, Robert. I was involved in Fowler conversions. Steam Wld, 2006, (231), 21. See letter from M. Cooper on p. 25 of Issue 228: writer involved in Derby Works Order No. 2507 to convert Fowler 2-6-4Ts with outside steam pipes (from cylinders). Also work to convert Fowler 2-6-2Ts in similar manner. Jackson, Jim..The Fowler 2-6-4 tank engine: a phenomenal machine. LMS Journal, 2008 (21) 8-11. Reports of high speeds being attained on the Watford to Euston outer-suburban services in the Railway Magazine eventually led to the imposition of a 70 mile/h speed limit on the class. Author considers that the Fowler type had the edge over the later 2-6-4Ts in terms of performance. Also evidence of very fast running by member of the class when one took over working The Yorkshireman from a failed Jubilee near Luton in 1939 and ran very rapidly with the express inot St Pancras. On page 191 Nock quotes from the famous Diamond paper which advocated long-travel valves: "the Author unhesitatingly recommends the universal adoption for compound as well as simple- expansion locomotives of the long-lap valves by means of which the port opening to steam at admission and exhaust can be materially improved." Cox (Locomotive panorama) has suggested that this led to the demise of Diamond, Nock makes a very different suggestion: "After the meeting, Fowler asked if he might borrow the script of the paper, and he took it back to Derby next morning. The design for the new 2-6-4 tank engine of the '2300' Class was then on the drawing boards, and he told the Chief Draughtsman, Herbert Chambers, to scrap the valve gear and modify it to Diamond's recommendations, with the happy result told in a later chapter of this book. Powell, A.J. Stanier locomotive classes. 1991. In 1927 Fowler introduced some highly successful parallel boilered 2-6-4T locomotives to handle heavy suburban passenger trains. With an excellent boiler and long-travel Walschaerts valve gear they proved to be very speedy and were more than once timed at 90mph, despite coupled wheels of only 5ft 6in diameter. Clearly this was a design which Stanier could endorse, but which could not be redesigned immediately to incorporate his own ideas. The last 30 locomotives to be built (Nos 2395-2424) in the 1933 Building Programme were therefore modified from the original design as a halfway stage before the taper boiler version could be produced. The more visible changes were the provision of double side-window cabs, wheels with tri angular rims and built-up balance weights, and side bolster bogies and bissel trucks. These locomotives did splendid work on suburban services in the St Pancras, Stoke, Manchester and Glasgow areas, over the Central Wales line and on banking duties from Oxenholme and Tebay on the West Coast main line. No. 2313 was named The Prince when the Prince of Wales visited Derby Works in February 1928. At that time the klocomotive had brakes on the pony truck and bogie. Rowledge, P. The Maunsell Moguls. 1976. (Locomotion Papers No. 99). As a consequence of the SR derailment the CME of the LMS, Sir Henry Fowler, contacted the Chief Inspecting Officer of the Ministry of Transport Sir John Pringle. The latter suggested that provided the new LMS tank engines were not used for high speed work he saw no reason why they should not be built. Perhaps Fowler made this enquiry with possible adverse public reaction in mind, but the LMS 2-6-4T quickly established a fine reputation on the fastest outer London suburban trains, where quite long runs of speeds of up to 80 mph were every day occur ances. There was never any accident that could be held attributable to their design on any section of the LMS. The introduction of the British Railways development of the LMS 2-6-4T on Southern lines in 1950 did not attract adverse comment, but in the meantime the standard of SR track had been greatly improved and there was no need to use these engines on principal express services. Specht, John E. Steam on the misery line [London, Tilbury and Southend line]. Backtrack, 1998, 12, 588-93. Steam working on the LTSR section with particular attention being made to the Stanier three-cylinder 2-6-4Ts. Two Fowler 2-6-4Ts were sent to the line, but were very uncomfortable for bunker-first running. Records that whilst the class was briefly allocated to Manningham, No. 2304 partially derailed (leading coupled axle) and damaged the track at Apperley Junction. There was a literal cover-up of the locomotive and no official inquiry, but the locomotives were moved elsewhere. Topping, Brian. Anytime, any place, anywhere...[LMS 2-6-4Ts: Fowler type]. Steam Wld, 2004 (208), 54-8. In spite of the banal title the feature includes some useful information, noting that the design was based upon the inauspicious MR 0-6-4Ts, but with outside cylinders, Walschaert's valve gear and a pony truck. Notes how Diamond's ideas on long travel valve gear was incorporated and how the design followed much of that of the SDJR 2-8-0 and to an extent the Horwich 2-6-0. Nevertheless, the introduction is misleading as it mentions suburban services out of Fenchurch Street to which this type was not applied. :" .. . in 1930 one of the feeblest locomotives of modern times was produced, under boilered, carrying too much deadweight for its power, and retaining a thoroughly inefficient front end.. .". These are Cox's words on the class 3 (Locomotive panorama v.1 p.66). Goslin noted that following the brief employment of ex-NSR 0-6-2T No. 2258 in 1927 on St Pancras suburban services that fifty class 3P 0-6-2Ts were included in the 1928 building programme, but these were delivered in 1930/1 as 2-6-2Ts. New 2-6-2 tank engines, L.M.S.R. Rly Mag., 1930, 66, 450 + plate f.p. 421. illus. 2-6-2 passenger tank locomotives, London, Midland and Scottish Ry.. Loco. Rly Carr.Wagon Rev., 1930, 36, 148.diagr.(s.el.) illus. p.132. Condensing tank locomotive, L.M. & S. Ry.. Loco. Rly Carr.Wagon Rev., 1931, 37, 89. illus. A 2-6-2 tank had been a Derby dream over many years right back to Deeley's time and there were in the archives diagrams of at least half a dozen previous attempts which had come to nothing- some of them of the most fearsome aspect. Now, and finally, in 1930 one of the feeblest locomotives of modern times was produced, under boilered, carrying too much deadweight for its power, and retaining a thoroughly inefficient front end, for which use of the double exhaust valves did practically nothing to remedy. It was designed in a portion of the same office, divided only by a partition from the other part, which had already produced the entirely excellent 2-6-4 Tank. I think this fact is some evidence that Fowler, who after all was finally responsible, did not have any very clear ideas on locomotive design as such, whatever his other abilities. R.L. Vickers.The LMS Class 4 tanks. Letter Backtrack, 2013, 27, 510. Writer compiling the Railway Correspondence & Travel Society volume on 'LMS Passenger Tanks:.the piece mentioned that the 3P 2-6-2Ts were not so successful  to be polite. Those enginemen who worked on the 3Ps are still trying to forget the experience. Now in his researches he has discovered that when very new the 3Ps were warmly welcomed. The 'Locomotive Practice and Performance' section of the Railway Magazine for May and June 1931 had a discussion by Cecil J. Allen of details sent to him from a correspondent in the West Midlands. The 3Ps were noted for their comfortable cabs, power and silent running. They had a 'soft blast' and were liable, even when brand-new, to blocked tubes and other problems. Mr. Allen and his correspondent wrote that such problems were common on the new "thermally efficient" locomotives, especially those with "long lap long travel valves"  which were not fitted on the Fowler 3Ps. The later Stanier locomotives did have them and were no great improvement on the Fowler tanks. In 1941 tests were made on Stanier 3Ps in runs on the Derby-Darley Dale route. The test locomotives were fitted with various blast modifications. The final report in April 1942 recommended the fitting of annular (ring within a ring) orifices in the blastpipe. This was later done on many engines, to Order 665. This class was built for dock working and had a short wheel base and outside cylinders. See the Coleman page to see the affection for which the man who draughted this design felt for it. Wikipedia notes: aided by the use of Cartazzi self-centring axleboxes on the rear axle, allowed the locomotive to negotiate curves of 2½ chains. New dock-shunting 0-6-0 tank engine, L.M.S.R.. Rly Mag., 1929, 64, 186-7. illus. Keith Miles. Coleman's babies. LMS Journal, 2011 (36), 59-67. These rugged little engines were admirably suited to work dock and other areas where there were tight curves, being on a very short 9ft 6in wheelbase, equally divided. Ten were constructed to O/7137 issued on 30 May 1928, and emerged from Derby Works during December 1928 and January 1929: five being sent to Scotland and the remainder to the Birkenhead and Fleetwood depots, their running numbers being 11270-79. They had outside I7in x 22in cylinders, and the valves were actuated by outside Walschaerts valve gear. The driving wheels were 3ft 11in diameter and length over buffers was 27ft 6in, the overhang being 9ft each side of the driving wheels. The saturated G5 boiler gave a heating surface of 923ft2 and the firebox added 85ft2. Grate area was 14.5ft2 and the tractive effort at 85 per cent boiler pressure (160psi) was 18,400Ibf. The tanks carried 1,000 gal of water and the bunker 1½ tons of coal, the weight in working order being 43 tons 12cwt. They were regarded as a standard LMS design. Fowler had reboilered the Johnson 1899 Midland class 3F with Belpaire boilers from 1919. This formed the basis for the design which became the standard LMS shunting engine, built in batches from 1924. Enthusiasts tended to call them Jinties. A few were used as passenger locomotives, mainly in South Wales, and for a time on suburban workings from Broad Street over the Great Northern lines. Several are preserved. The LMS Profile No. 14 is clearly now the key source. TANK locomotive, L.M.S. Ry.. Loco. Rly Carr. Wagon Rev., 1928, 34, 139. illus. Beardmore series: some fitted with vacuum brake for passenger work. No. 16613 illustrated..
Pp 90-1 describe the repatriation from Saveney in France in 1948 of five of the eight locomotives supplied to the BEF. Essery, Bob. What was a 'Jinty'? Steam Wld, 2008 (252) 20. See Issue 250 Call Attention information from Jim Perkins claims that Saltley footplate crews did not call 3F 0-6-0T shunters 'Jinties' but used term Jocko for all shunters. Considered that they were "good shunting engines, with rapid acceleration, they could 'lift' a heavy train quite 'smartly', and had a good brake, very important when shunting". Essery, R.J. and Toms, G. The LMS 'Jinties': properly known as Class '3' 0-6-0T. R.J. Essery and G. Toms. Br. Rly J., 1985, 1, 277-83. Table 1 lists main dimensions; Table 2 lists main variations (screw reversing gear, carriage warming apparatus; push-pull apparatus for Swansea to Brynamman services; ATC apparatus and brackets for destination boards (for services from Broad Street)); Table 4 shows locomotives involved in WW2. Illustrations clearly show most of the main variants: Ramsbottom safety valves, Ross pop safety valves and keyhole sandbox filler. Gahan, J.W. The unsung "Jinties". Rly Wld, 1961, 22, 368-9.3 illus. During the last years of steam standard 0-6-0Ts without condensing apparatus were used on cross London freights via the Widened Lines: 47642 is illustrated passing London Bridge heading homewards on 2 May 1962. Stubbs, W.T. and Ware, H.M. The Midland class 3 0-6-0 tanks. Rly Obsr, 1948, 18, 162-3. table. Thorley, W.G.F. A breath of steam.1975. At Devons Road in 1937 the author noted that a proportion of the Class 3FT engines were reserved as far as possible for passenger working, because they had been specially fitted with screw-operated reversing gear which obviated the need to close the regulator whilst notching up and avoided the surge noticeable in a close-coupled train when the lever reverser was in use. Two minor but irritating difficulties seemed to persist on the standard engines. One related to the amount of moisture which always seemed to permeate the sand in the sand boxes despite alternative designs of filler necks which had been tried. The majority of the allocation had left the depot by 10.00am and along every pit road were little piles of sand where it had been emptied from the boxes. This trouble was not, of course, peculiar to this class of locomotive, but it was more in evidence than on any other class known to him. The other source of trouble was maintenance of the light, brass whistle operating chain, which was not equal to its task and possessed attractive alternative applications. The 4-4-2T was the standard motive power for passenger traffic on the LT. & S.R. When more locomotives were required for this section, the L.M.S. built a slightly modernized version in batches between 1923 and 1930. Proud, P. The large Tilbury 4-4-2T's. Rly Obsr, 1956, 26, 94-7 + 4 plates. 8 illus., 3 tables. D.F. Tee added some further material on pp.154-5. Construction of a batch of ten 4-4-2 unsuperheated tank engines for the London, Tilbury & Southend line, the first of which only remained in the erecting shop for 11 days and was completed in May, 1923. These engines, Nos 2110-19 were built to O/5871 placed on 5 February 1923 and were officially the "rebuilding" from No, 1 to No 3 power class of existing tank engines, although the original engines were not withdrawn until 1930-5. They were basically the LTSR design of 1909 but somewhat "Midlandised". The outside 19in x 26in cylinders drove the 6ft 6in diameter coupled wheels placed at 8ft 9in centres. The leading bogie, centred 10ft 6tin in front of the leading driver was carried on 3ft 6in diameter wheels at 7ft centres, whilst the trailing pony truck, also on 3ft 6in diameter wheels, had its axle centred 8ft behind the trailing driver. Class 3 boilers, Nos 5526-35, pressed to 170psi, were fitted, and with 1,800gal side and back tanks and room for 2¾ tons of coal, the working weights were: bogie 20.5 tons, driving 19 tons, trailing 18.5, pony truck 13.5 tons: total 71.5 tons. A further batch of Class 3 4-4-2 passenger tank engines for the LTSR lines to O/6751 were numbered 2125-34 (later BR 41943-52). They were similar to those built to O/5871 and were turned out between May and July 1927. . Some allege this archaism to be the work of Stanier! Small class of Fowler/Lemon "design" for branch lines. According to Essery this introduced to the LMS certain features that were to be used in future LMS Stanier designs, notably built-up balance weights, spring balanced reversing shaft and side bolster bogies. They had stove pipe chimneys, later replaced, and second-hand boilers. Cox Locomotive panormama Vol. 1 stated that "Anderson, abetted by Harold Rudguard, an up and coming key motive power influence on the Midland division, demanded a replica of the Johnson design, the bulk of which had been built during the previous century. Once again, if a 0-4-4T was really the only solution, there was a more modern version already designed and in being on the North Stafford. Since only 10 were required what more simple than to build up the Stoke drawings? But no, the Midland mystique must have its fling  a final one as it turned out  and the drawing office was solemnly set to dressing up this ancient design with different smokebox, cab, tanks and trailing bogie, all of which contributed nothing at all to performance. However, there was one shattering break with past tradition, the engine was turned out with a stovepipe chimney! 0-4-4 tank engine, No. 6408, L.M. & S.R.. Loco. Rly Carr. Wagon Rev., 1934, 40, 263. illus. Appleton, Alex. The 1932 0-4-4Ts of the LMS. Br Rlys ill., 1993, 3, 116-25. Essery, R.J. and Toms, G. The LMS 0-4-4 tanks. Br. Rly J., 1986, 2, 156-60. Goslin, Geoff. The LMS 0-4-4 tanks. Br. Rly J., 1986, 2, 263. James, Fred and Essery, Bob. LMS Journal, Introductory Issue, 4-26. Langridge, E.A. Under ten CMEs. 2011.
p. 135: a proposed 0-4-4T got as far as an outline drawing, S4613. Some details were drawn out before the job was put aside, only to be taken up seriously again just before Stanier's arrival. p. 143: following Stanier's arrival: The drawings of the 0-4-4T were slowly taking shape, but early in 1932 there was talk of altering the wheel diameter from 5 ft 7 in to 5 ft 3 in, replacing the exhaust injector by a live steam one. p. 149: Some drawings of the 0-4-4T were still on the boards. Of course Chambers was on tenterhooks and Stanier on the defensive. The only remark made within my hearing was, 'Can't you get a long travel gear on it? ', which, as it was a slide valve job, did not strike me as very deep thinking. L.M.S. 0-4-4T 6400 class. Rly Obsr., 1935, 7. 96. illus. Includes notes on the alleged origin of the boilers from scrapped M.R. 2-4-0s and 0-6-0s. Riley, R,C. The LMS 0-4-4 tanks. Br. Rly J., 1986, 2, 263.. The reference quoted refers to the reboilering of the Johnson 1881 0-4-4Ts with Belpaire boilers. It is uncertain whether this refers to a 1926 modificiation of the design, or whether the new boilers were first noted by the editor of the Locomotive in 1926. REBUILT passenger tank engines, L.M. & S.R. Loco. Rly Carr. Wagon Rev., 1926, 32, 347-8. illus. This design formed part of a range of standard, Kitson industrial locomotives, but was slightly modified for L.M.S. service. It is often, incorrectly?, attributed to Stanier. 0-4-0 saddle tank locomotives, L.M. & S. Ry. Loco. Rly Carr. Wagon Rev., 1933, 39, 33. Kitson WN 1540-4: smoke eliminator fitted to WN 1544 described on Loco. Rly Carr. Wagon Rev., 1933, 39, 94. [LMS order placed with Kitson & Co. for five saddle-tank locomotives]. Loco. Rly Carr. Wagon Rev., 1932, 38, 294. L.M.S. saddle tank locomotives. Engineer, 1933, 155, 151. illus. NEW saddle-tank shunting locomotives, L.M.S.R. Rly Mag., 1933, 72, 100. illus. It was also intended to construct a 2-8-2 using many components in common. Nock, O.S. Great locomotives of the LMS. 1989. On page 191 Nock quotes from the famous Diamond paper which had advocated long-travel valves: "the Author unhesitatingly recommends the universal adoption for compound as well as simple-expansion locomotives of the long-lap valves by means of which the port opening to steam at admission and exhaust can be materially improved." Cox (Locomotive panorama) has suggested that this led to the demise of Diamond, Nock makes a very different suggestion: "After the meeting, Fowler asked if he might borrow the script of the paper, and he took it back to Derby next morning. The design for the new 2-6-4 tank engine of the '2300' Class was then on the drawing boards, and he told the Chief Draughtsman, Herbert Chambers, to scrap the valve gear and modify it to Diamond's recommendations, with the happy result told in a later chapter of this book. Meanwhile, a most distinguished contributor to the written discussion on the paper was Monsieur A. Bréville, L'Ingeénieur en Chef du Matériel et de la Traction of the Northern Railway of France. He, as the designer of the brilliantly successful post-war 'Super Pacifics' of that railway, sent a fascinating account of tests they had made, not only with his own engines, but with the 'Pacifics' and 'Atlantics' of his predecessors. Fowler was nothing if not a copyist, and from the 'grape-vine' it was learned that the super-LMS compound was to be based on the principles of de Glehn rather than of Smith-Deeley. Cox (Locomotive panorama p. 52) added "Some old correspondence remains dealing with the means by which this idea for a large compound became grafted upon the Hughes 4-6-2 schemes and led to the ghostly compound Pacific, which very nearly came to be built somewhere about the end of 1926. It appears that immediately upon Hughes' retirement a deputation was sent out to visit France in October 1925. This consisted of Sir Henry himself, with Gass of Horwich, and Bulleid, then of the L.N.E.R. no doubt acting as interpreter. They visited all of the French main line railways, but did not, to their surprise, find a 100 % acceptance of the Compound principle, Bachellery of the Midi, Lacoin of the P.O. and Nasse of the Etat dissenting. However Vallentin of the P.L.M., Buchatel, Est, and Collin, Nord, plus Dubois of the Central Design Office spoke in favour with strong if somewhat diverse voices. They claimed a general 10 to 15% fuel advantage over simple expansion in everyday working, at an extra cost in repairs of only some 8% of the value of the coal saved. Their advice differed as to boiler pressure, ratio of cylinder volumes, independent or combined valve gears and receiver capacity. The evidence was thought sufficiently encouraging to go ahead, and a design team was organised forthwith to progress the matter. Gass took the lead at Horwich with cylinders and valve gear, Chambers tackled the boiler at Derby and Grover, Chief Draughtsman at Crewe, came in on the detail work. A meeting at Derby on October 23rd, 1925, settled the main details, which were set out in one of the last schemes I worked upon before leaving Horwich and illustrated by Fig. 7. Apart from what is indicated on this diagram, 9" dia. piston valves were proposed for H.P. and 11" for L.P. The drive was divided and two sets of outside Walschaerts gear operated the four valves. Separate H.P. and L.P. gears were ruled out because it was felt that both by training and temperament it was unlikely that British drivers would make full use of independent cut offs. Langridge Under ten CMEs page 90 states that Gass's paper on compounding (ILE 208) was the product of the French meeting. Barnes, Robin. Locomotives that never were. pp. 44-5. Mills, Bob. Derby's big engine. Backtrack, 2001, 15, 11-15. Three-cylinder compound 4-6-0: all three cylinders drove onto front axle - notes Gresley's objection to front-axle-drive; design used 0-10-0 Lickey banker's boiler, but lengthened and with larger grate area; cab as per Royal Scot; cylindrical smokebox; and possibly a tapered boiler. The intended boiler pressure is not known, but the design may have had long travel valves as these were favoured by Fowler. Radford Derby Works and Midland locomotives (page 149) noted that an inside-cylindered 2-6-0 tender engine with 5ft 3in driving wheels, 20in x 26in cylinders and a G7s boiler working at 160psi was proposed in 1910. Total engine wheelbase, with standard driving wheel spacing, was to be 22ft 9in and working weights were: engine 54.5 tons.